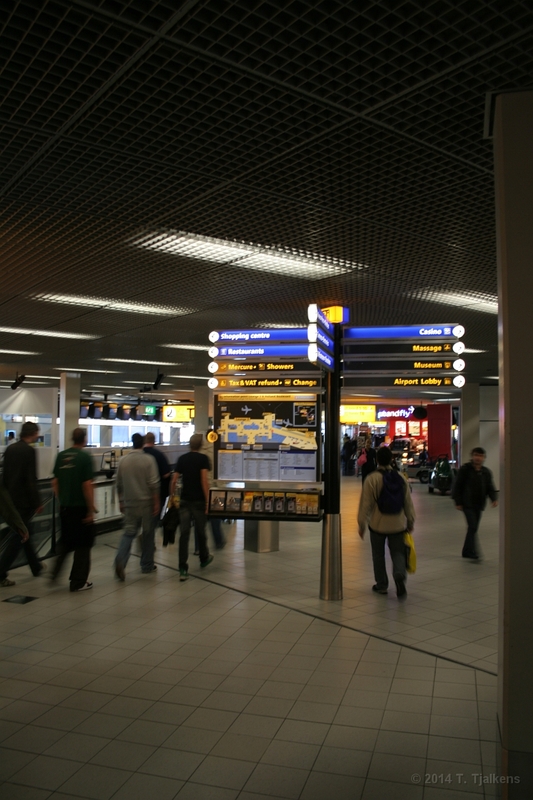 1 Schiphol Airport, just after the passport check. 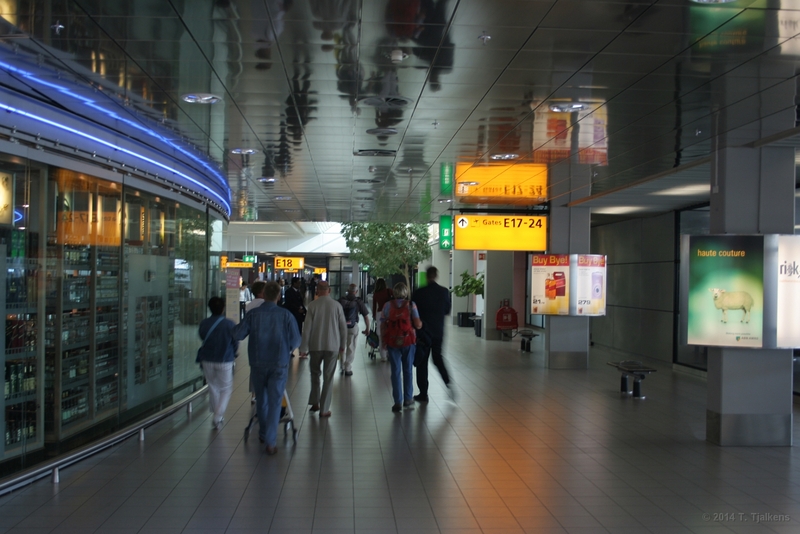 2 Schiphol Airport, on our way to the gates. 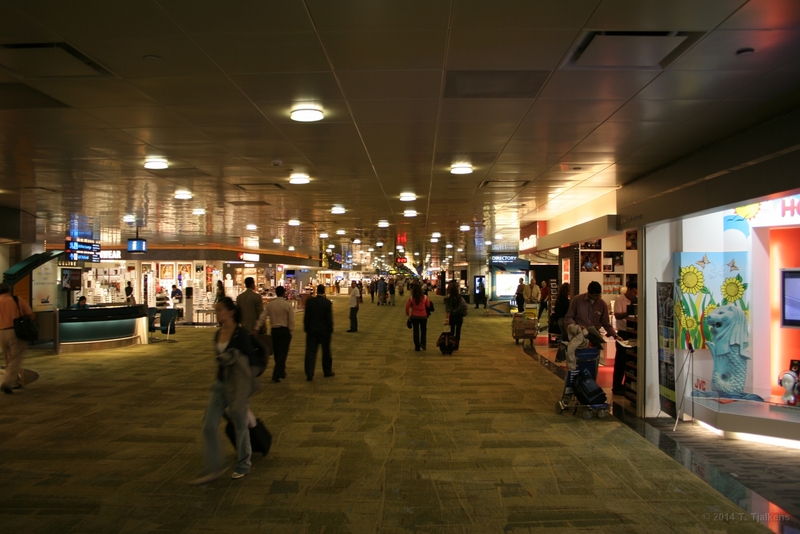 3 Singapore airport is a very big but clean airport. From here we took the plane to Bali. 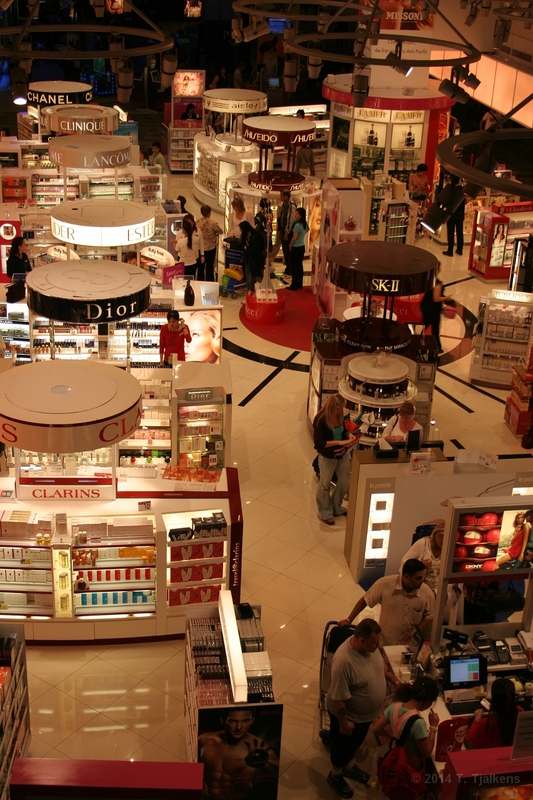 4 A big shop at Singapore Airport seen from above. 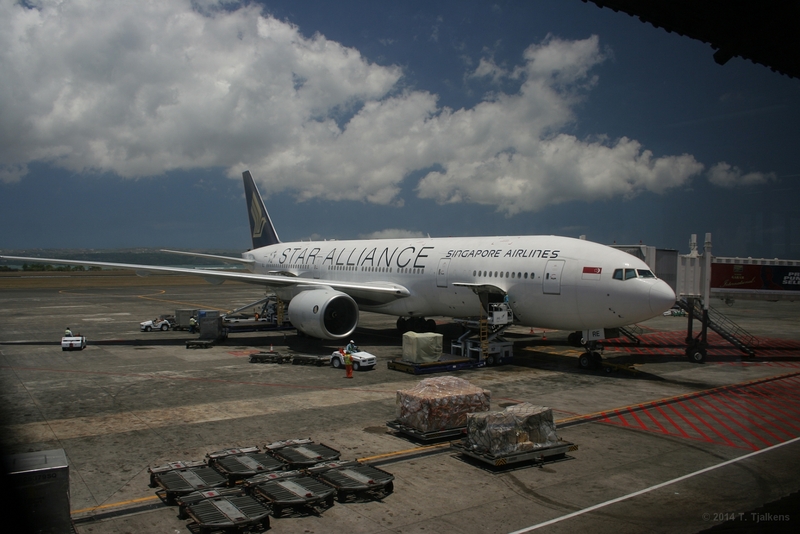 5 The plane from Singapore Airlines is waiting for us. 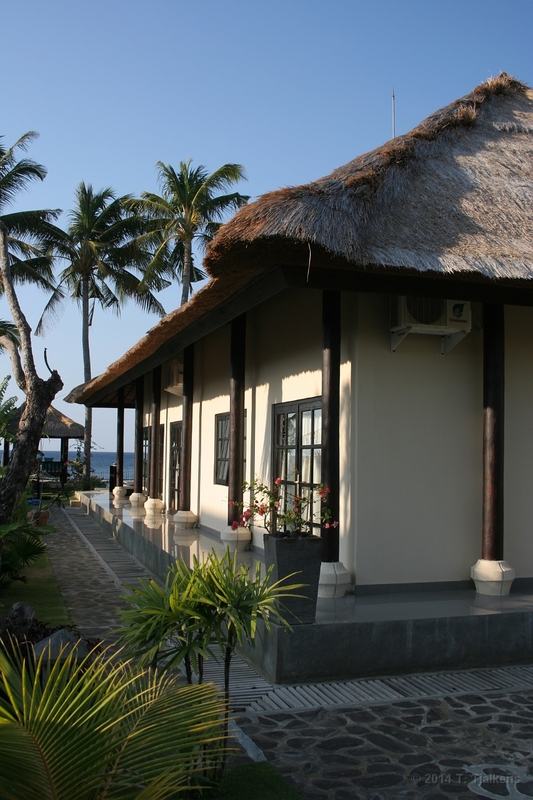 6 This is the place we rented, Villa Bali Paradijs in Lovina. 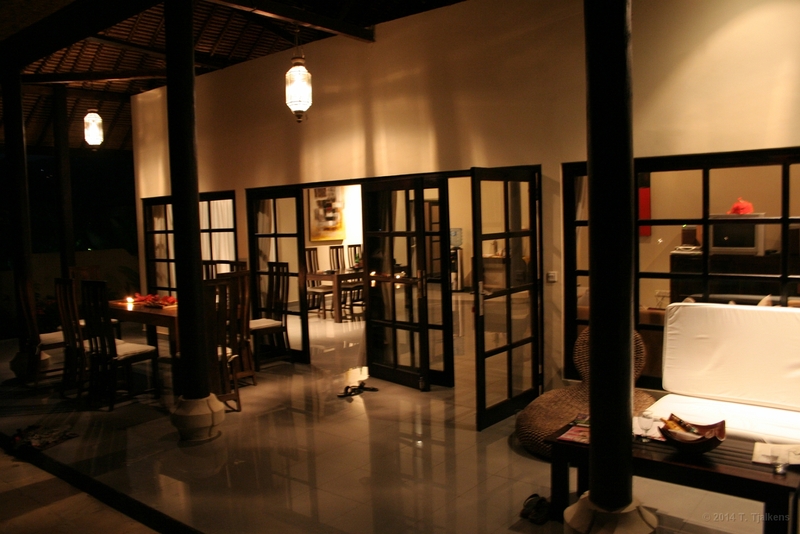 It included 3 large sleepingrooms, 3 bathrooms, large livingroom and 5 staffmembers! 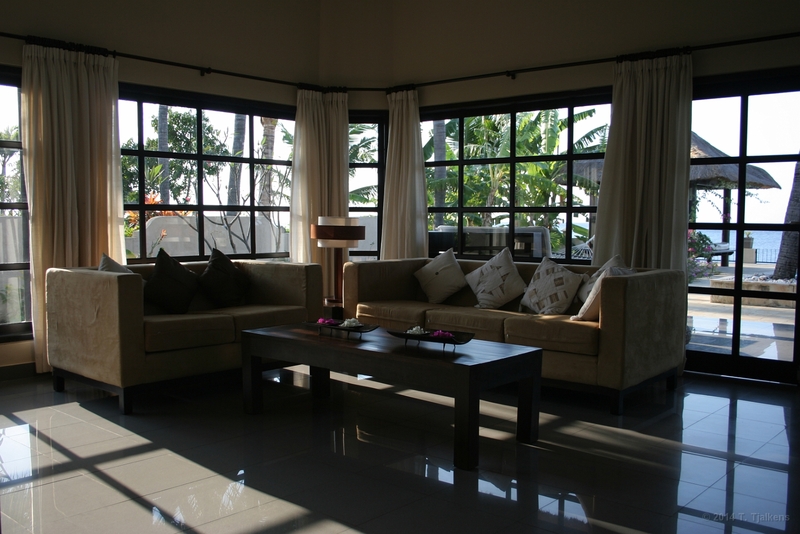 7 Villa Bali Paradijs living room with satellite TV, DVD and Karaoke set. We did not use them but they are there anyway. 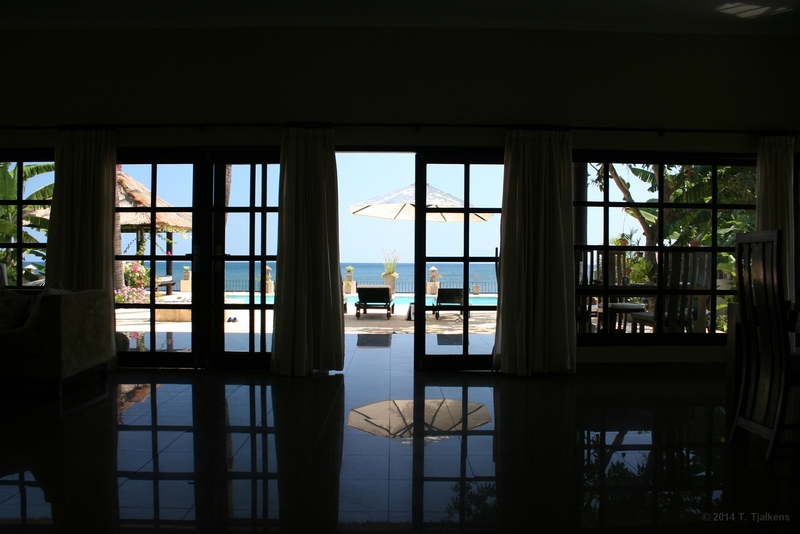 9 View from Villa Bali Paradijs inside to the pool outside. 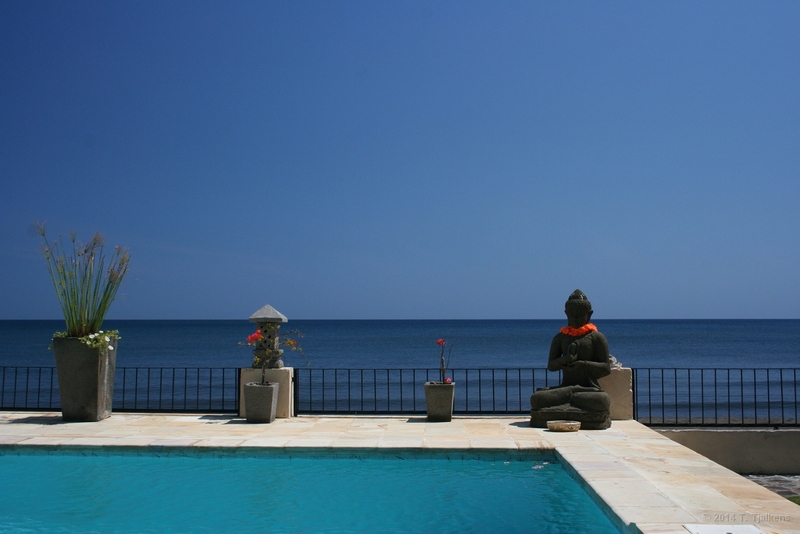 10 At the corner of the swimmingpool from Villa Bali Paradijs Lord Buddha is watching us. 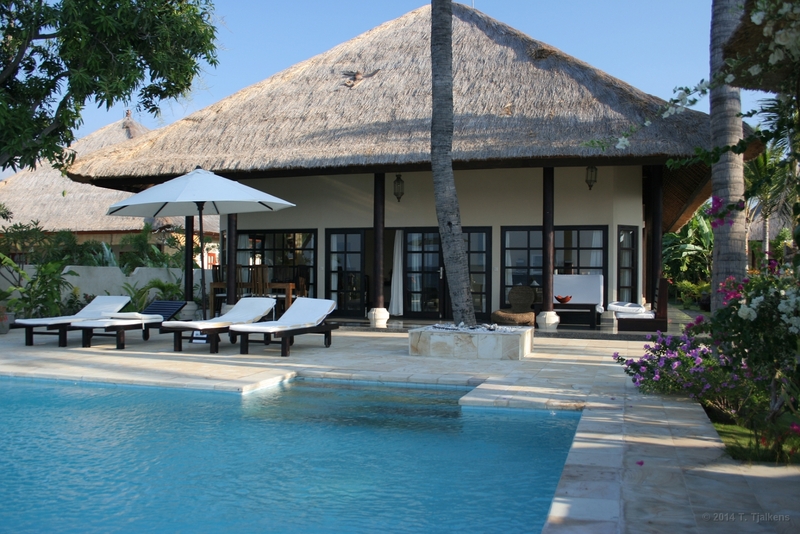 11 The garden from Villa Bali Paradijs is beautifull with a lot of palmtrees and a big pond in the front of the house. 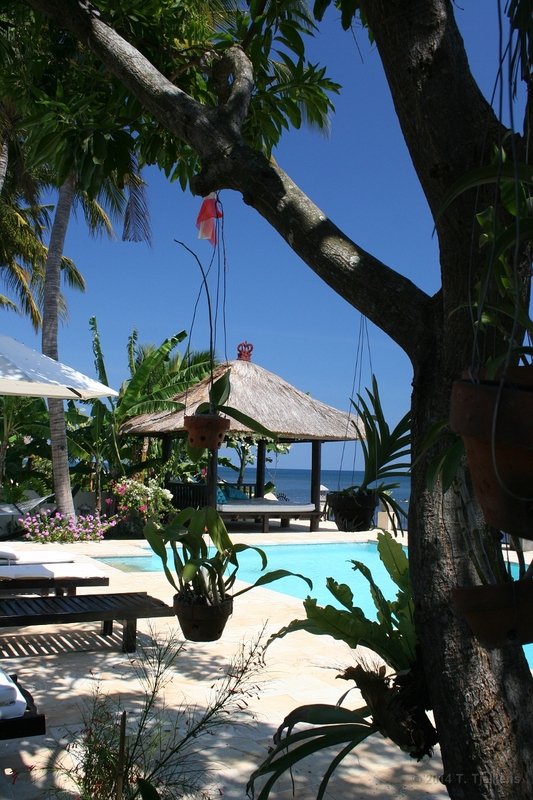 12 The swimmingpool from Villa Bali Paradijs from where you can look at the beach and the sea. 13 On the road from Singaradja to Lovina we noticed this farmer busy washing his two cows. 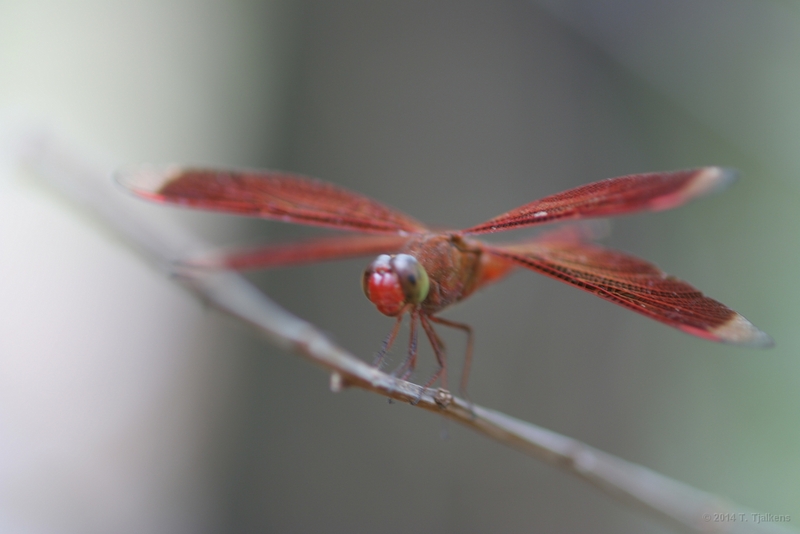 14 A beautifull red dragonfly. The wings are just like lacework. 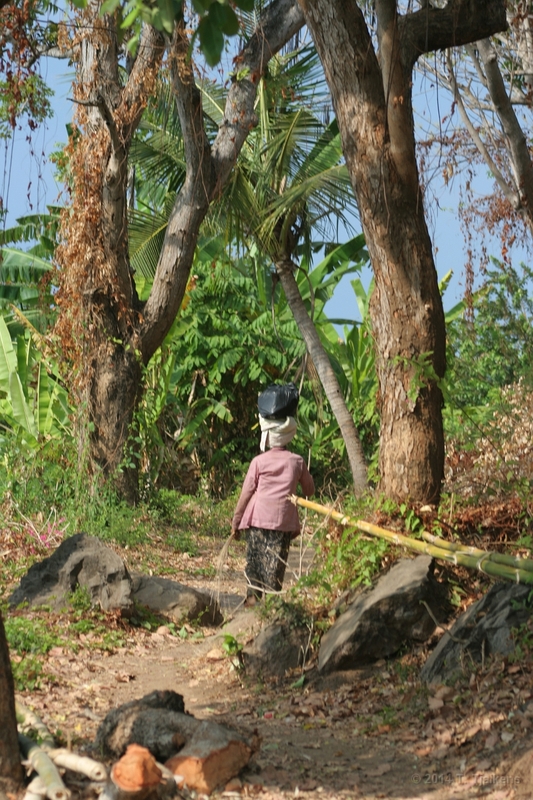 15 Walking through the vineyards we saw this woman with a bag on her head. 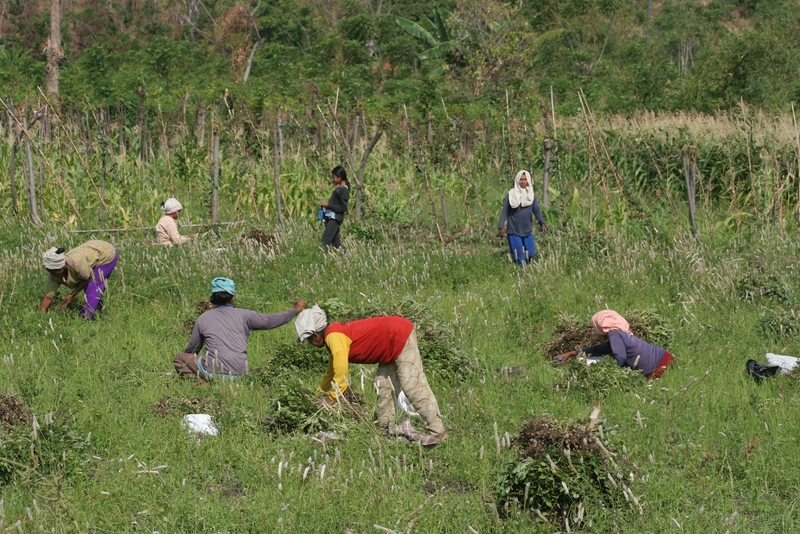 16 Local farmers are harvesting peanuts. 17 Temple for protection of the ricefields. 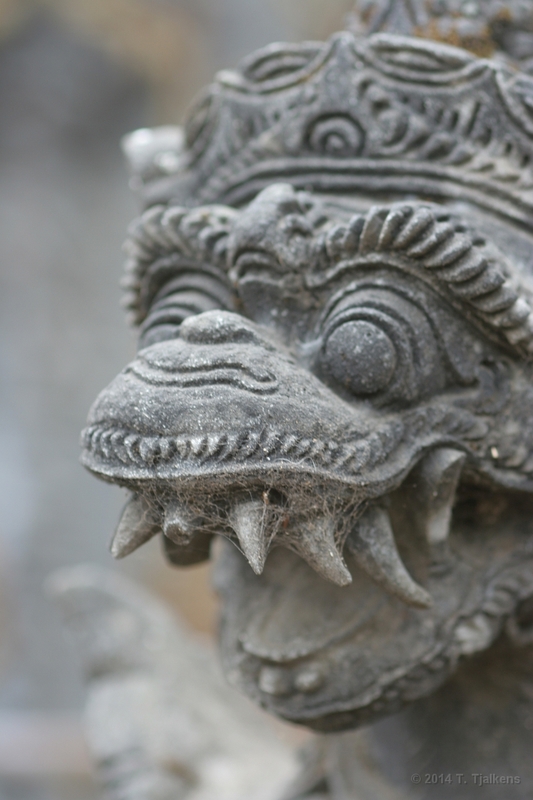 In Bali everything is protected by Gods and to keep them nearby people build this kind of little temples. 18 Landscape on our way to Gunung Batur. 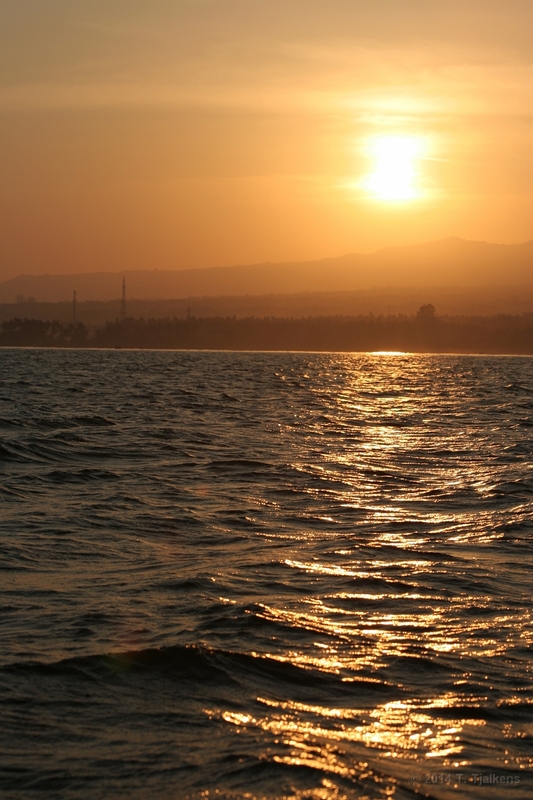 This is the north part of Bali. 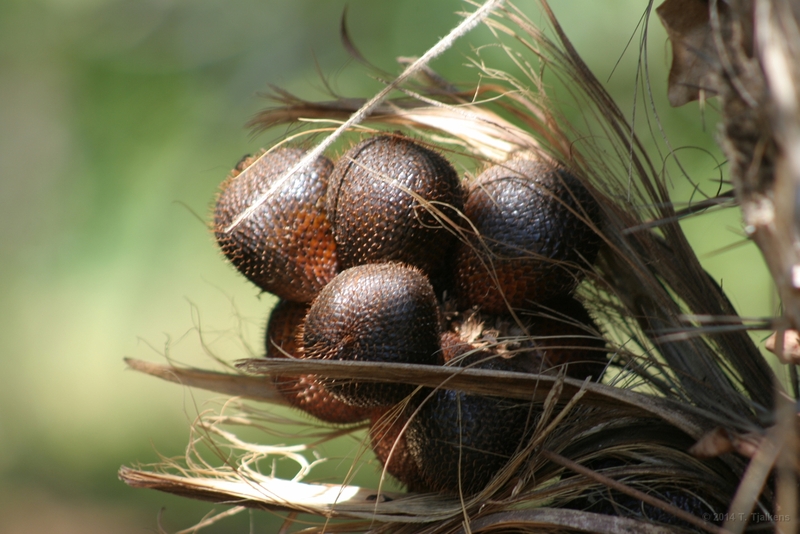 19 When we stopped to watch farmers drying cloves we saw some strange palm fruit on the other side of the road. It is eatable and very sweat. 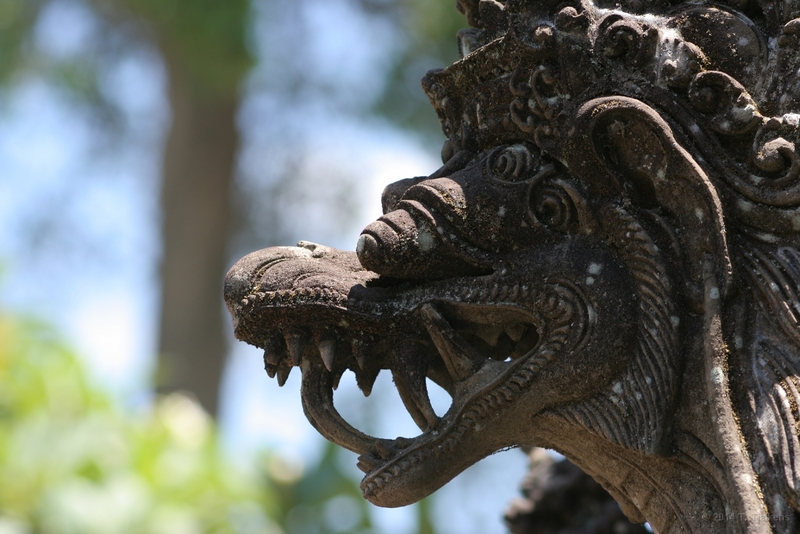 20 One of the biggest temples in Bali is the Besakih temple complex. 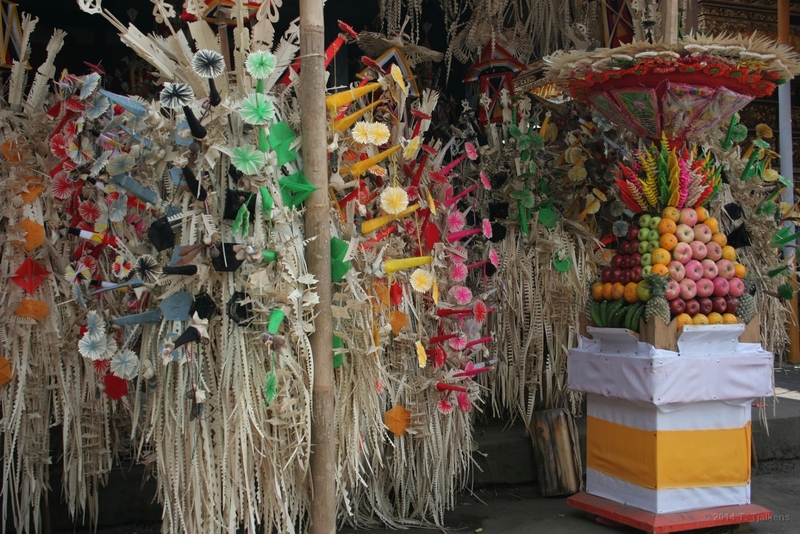 The Balinese people offer gifts to the Gods here. 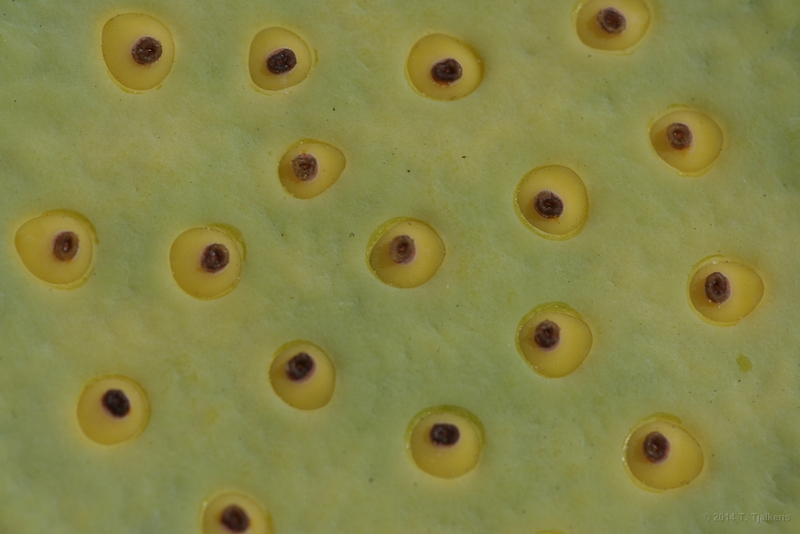 That can be fruit, but also living animals. 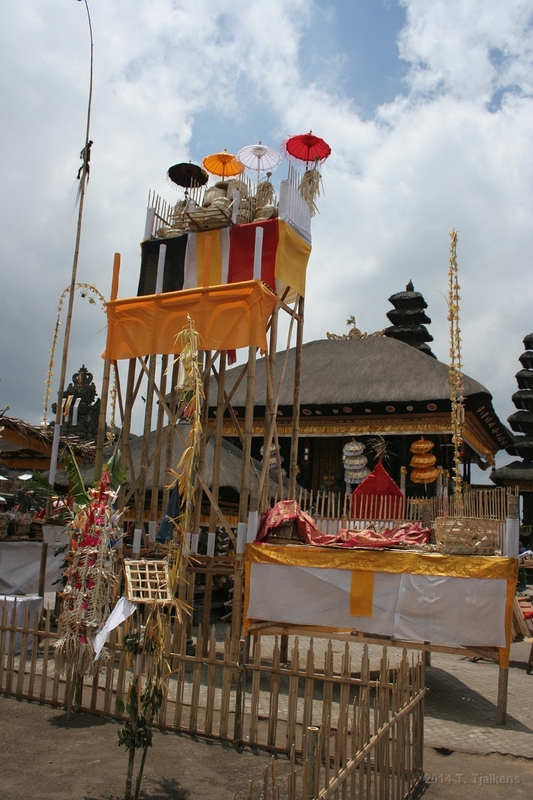 21 The parasols are protecting holy items for the sun at Besakih temple complex. 22 Close-up from the parasols, there are four of them: one for security, one for anchestors, one for Brahma and one for the favourit God of this temple. 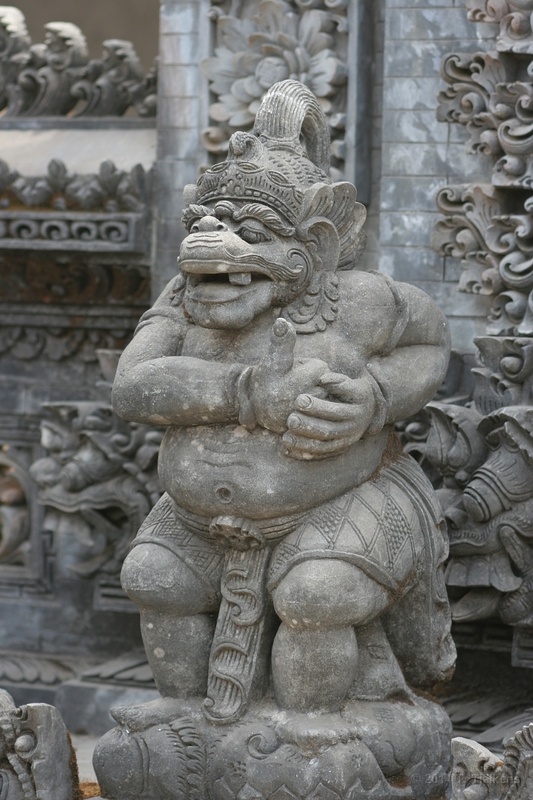 23 Statues are often very detailed and they mostly present Gods or demons. 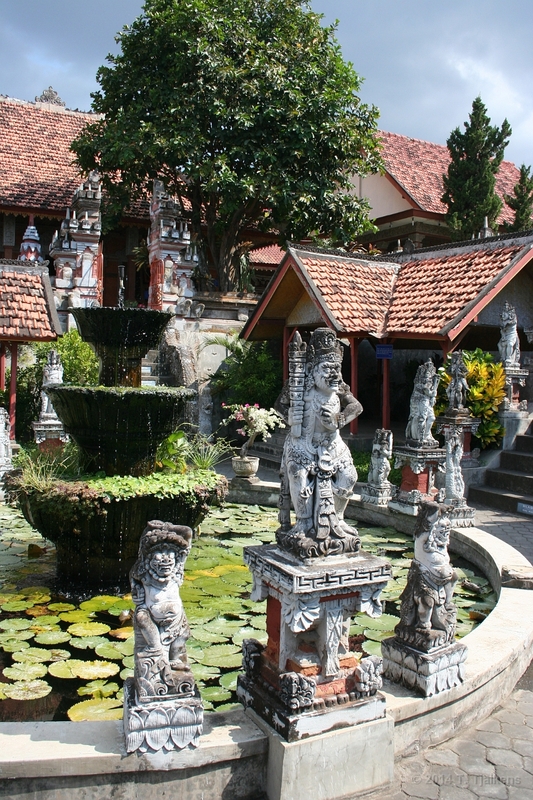 Besakih temple complex. 24 This statue is a watcher, he protects the gate from the temple. 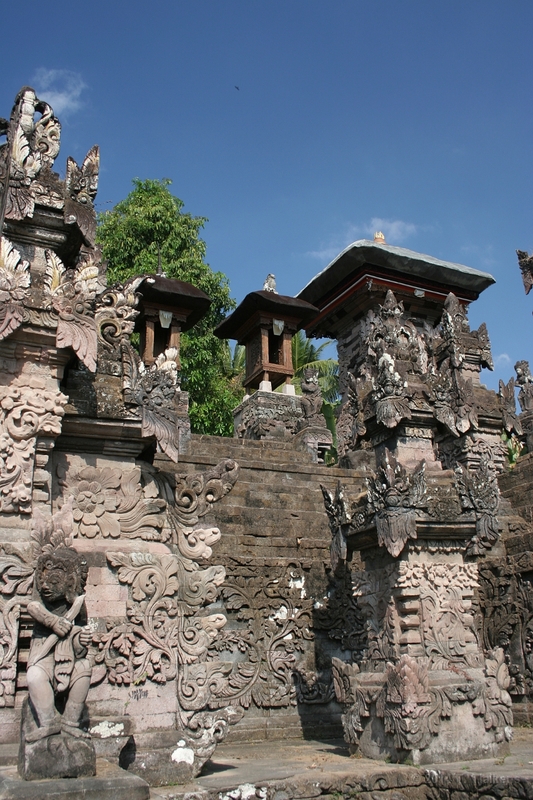 Besakih temple complex. 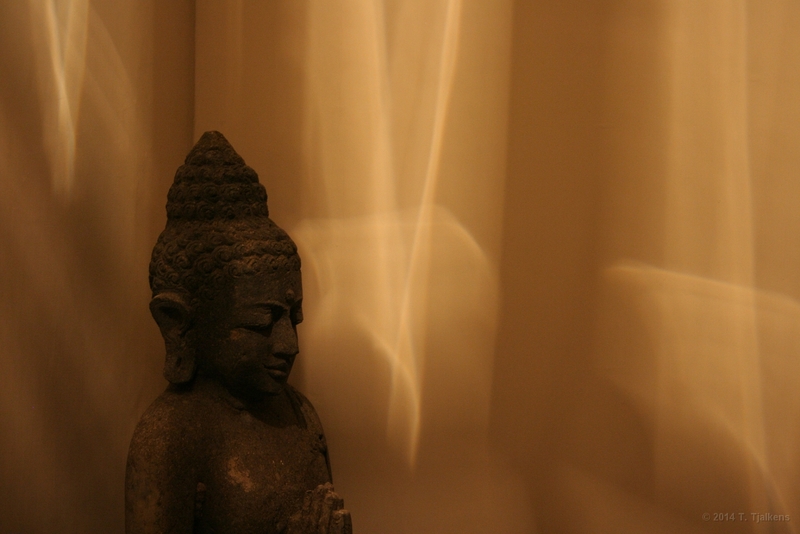 25 The statue is also a watcher and it's protecting holy items. 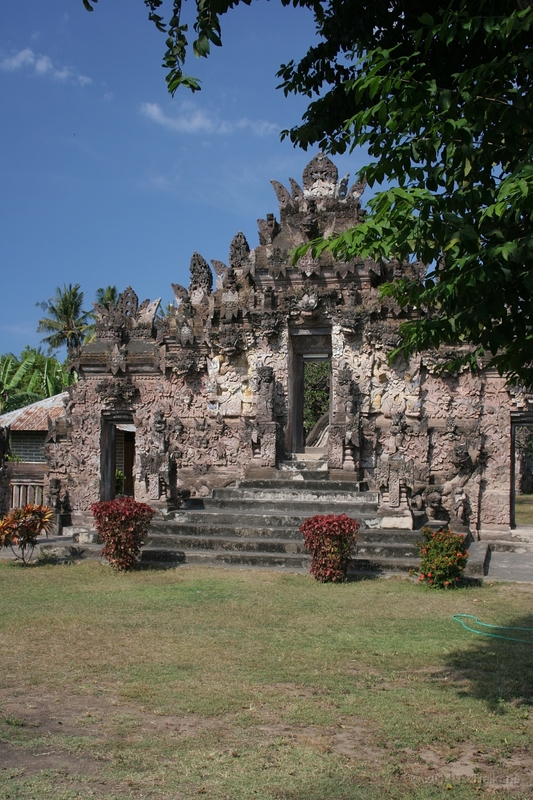 Besakih temple complex. 26 Very detailed demonshead. Like all the other statues and buidings this is also made from lavastone. 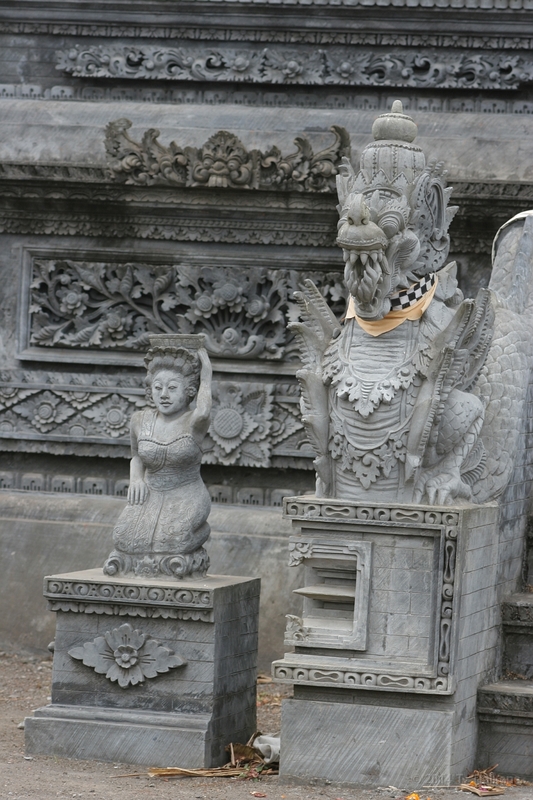 Besakih temple complex. 27 An other watcher. 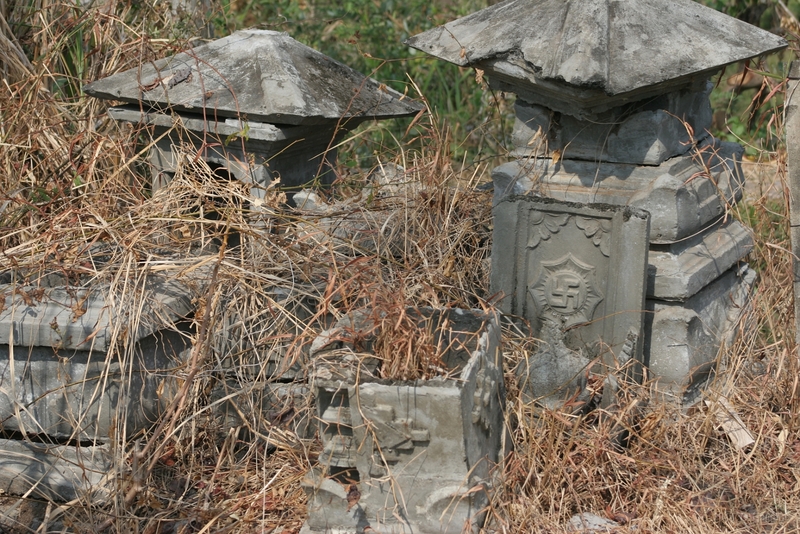 You will find this statues not only in the temples but also near bridges and entrance gates from villages and cities. 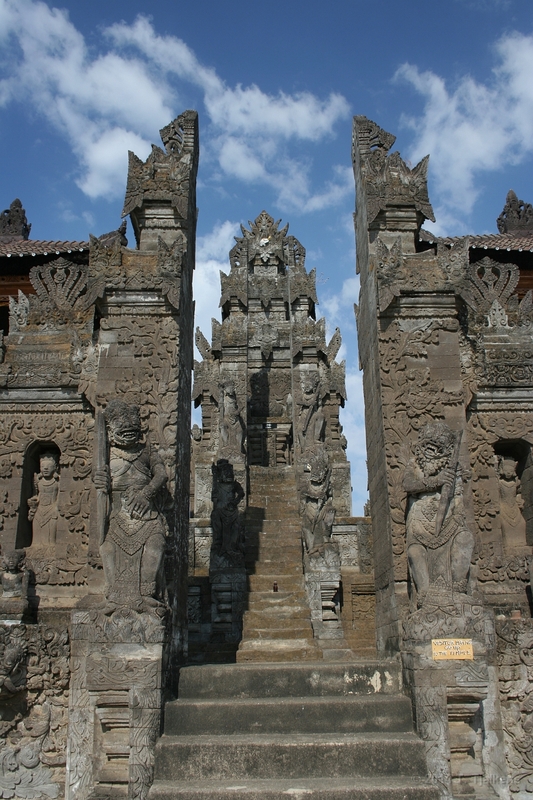 Besakih temple complex. 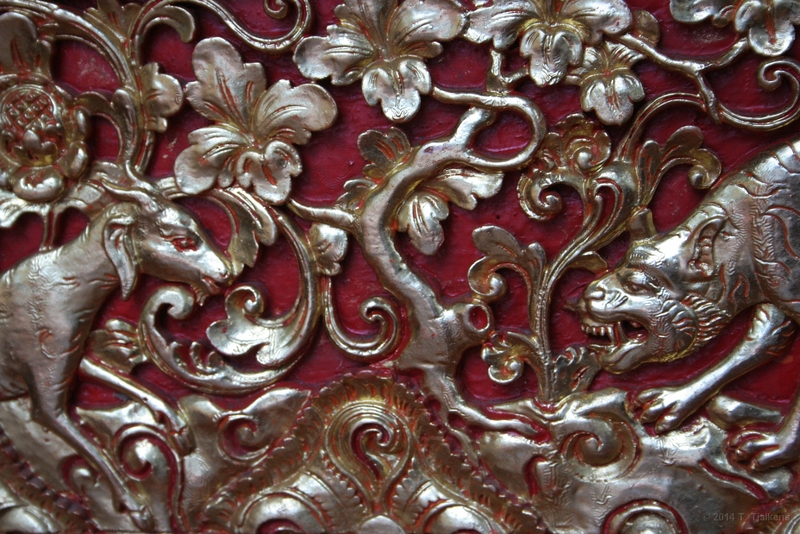 28 Detail of a golden chair which the Balinese use at ceremonies. 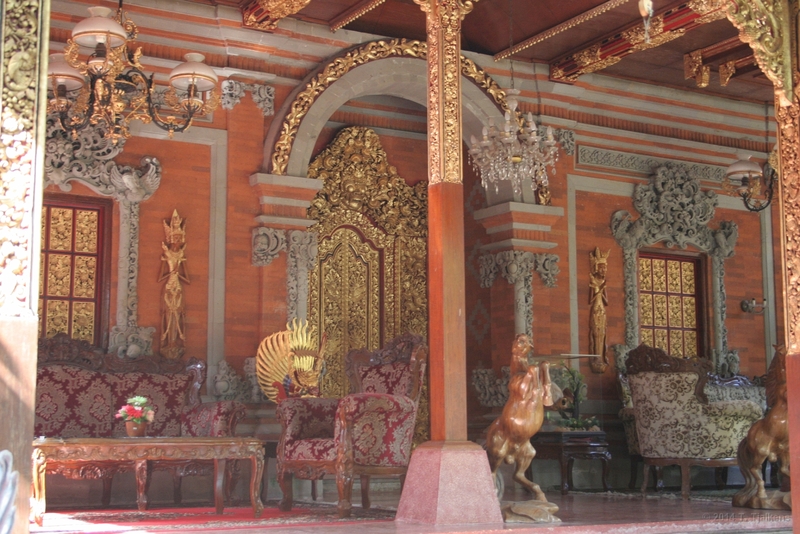 Besakih temple complex. 29 The spiderweb between the tooth of this statues looks great. 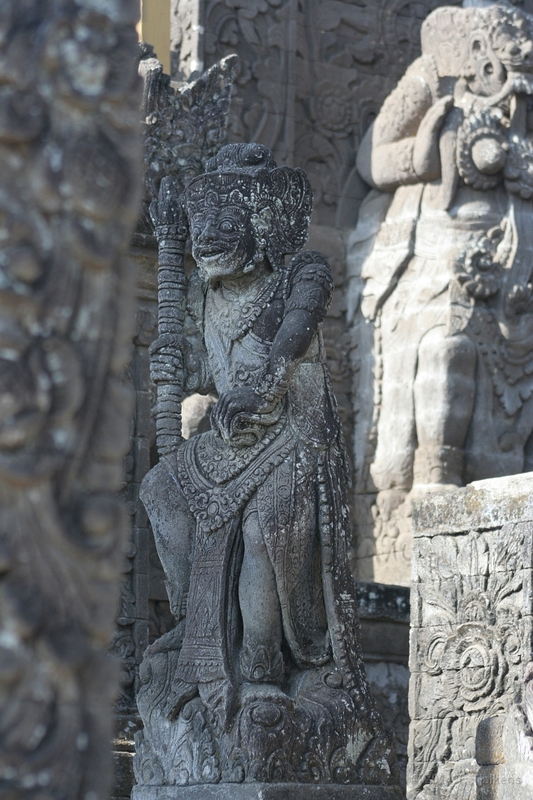 Besakih temple complex. 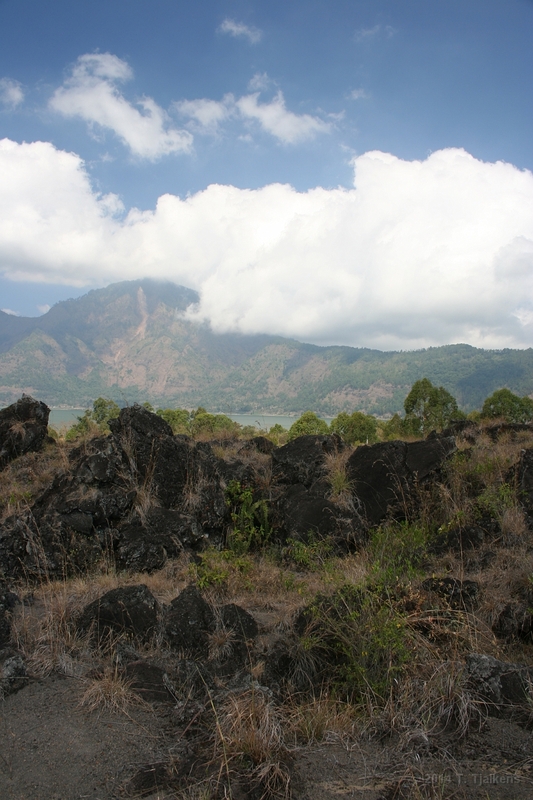 30 This is the Gunung Batur lavafield, which orginated from an eruption in 1993. It is black and sharp with big gas holes in it. 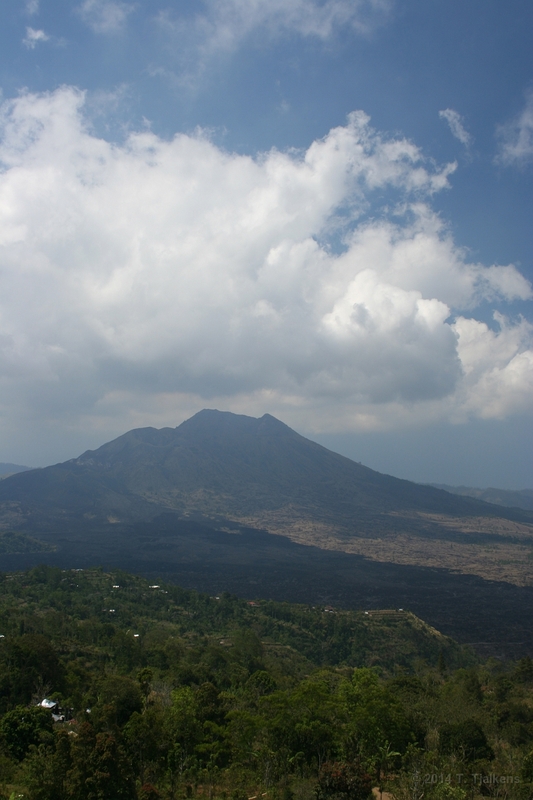 31 This is the Gunung Batur vulcano, it may look small but the caldera is 10 kilometer across! 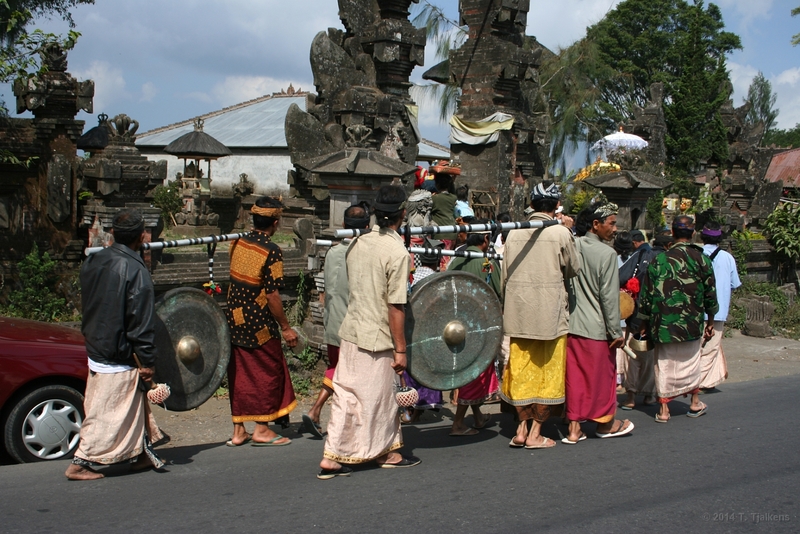 32 The Balinese have a lot of ceremonies, the whole village will be joining. Near Singaraja. 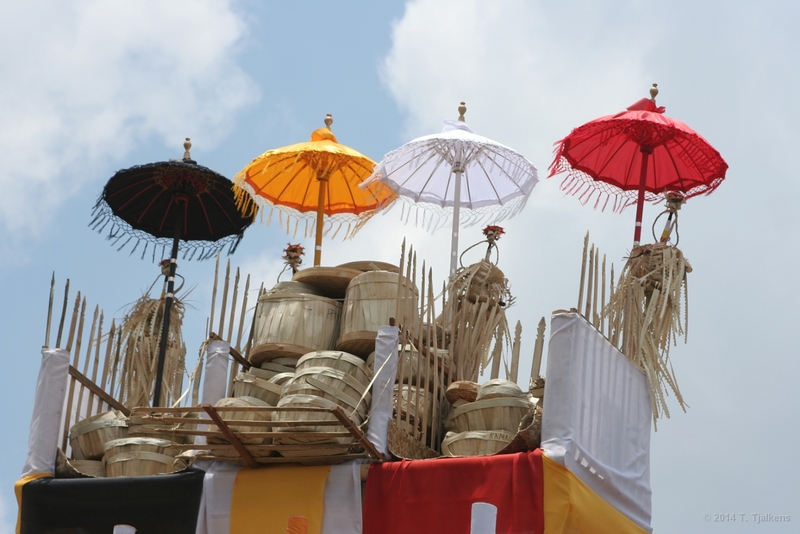 33 Cremation gifs, almost every Balinese will be cremated and that is a very big ceremony. Near Sigaraja. 34 Catamaran near Lovina beach. 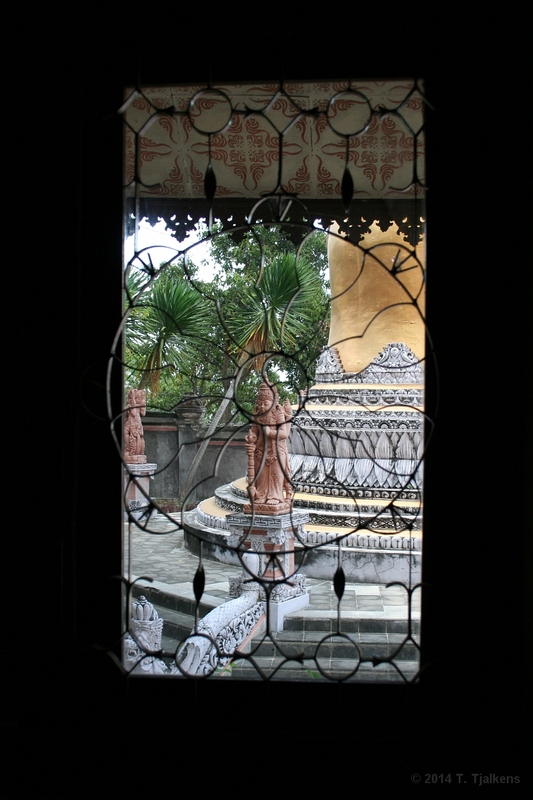 35 View through a window at the Bhudistic temple in Banjar. 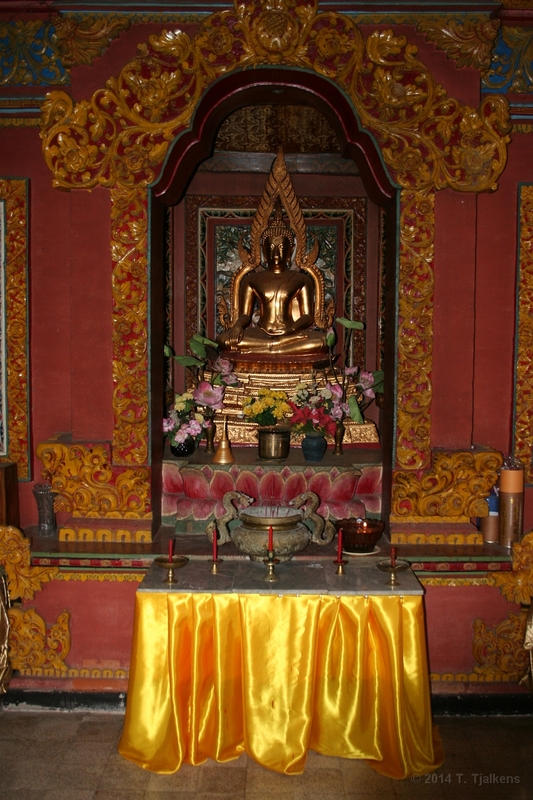 36 One of the Lord Buddha statues at the Bhudistic temple in Banjar. 37 A pond with fountain in the front of the Budhistic temple in Bajar. 38 At the highest point of the Budhistic temple in Bajar stands a big temple on it is own. 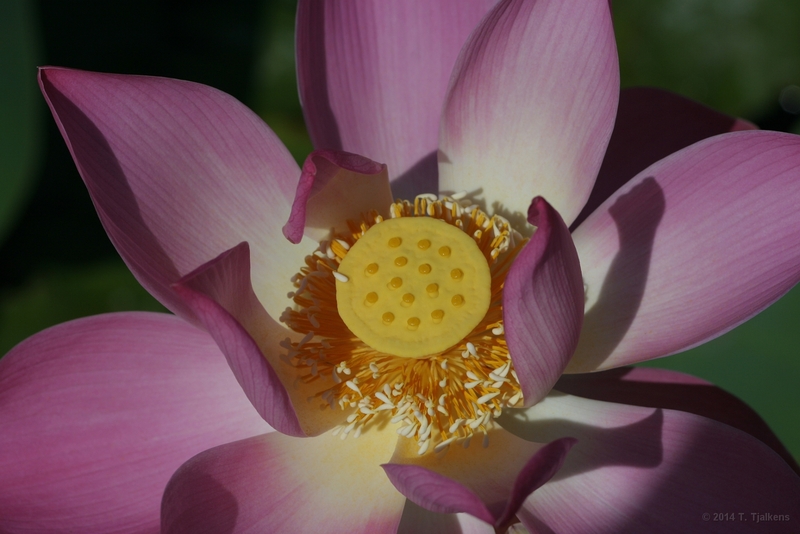 That temple is surrounded by a pond with beautifull lotusflowers and water lilies. 39 This is the close-up from lotusflower seeds. 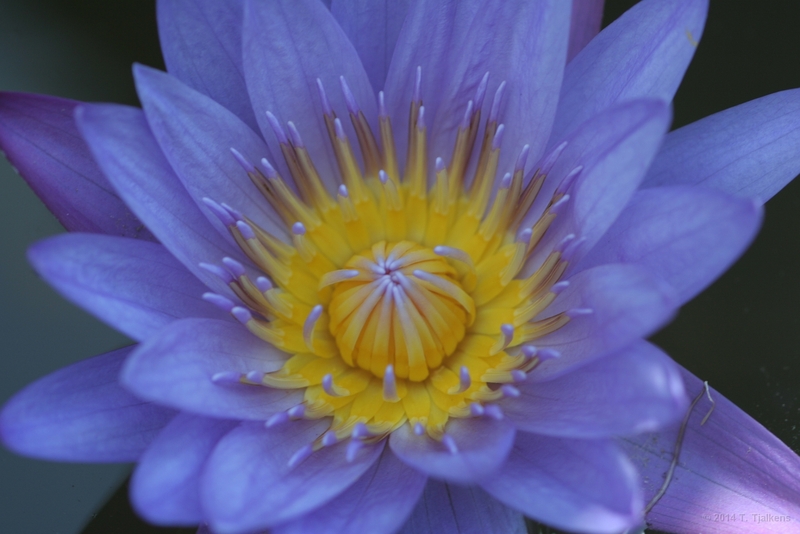 40 This is one of the beautifull blue water lelies in the pond from the Budhistic temple in Banjar. 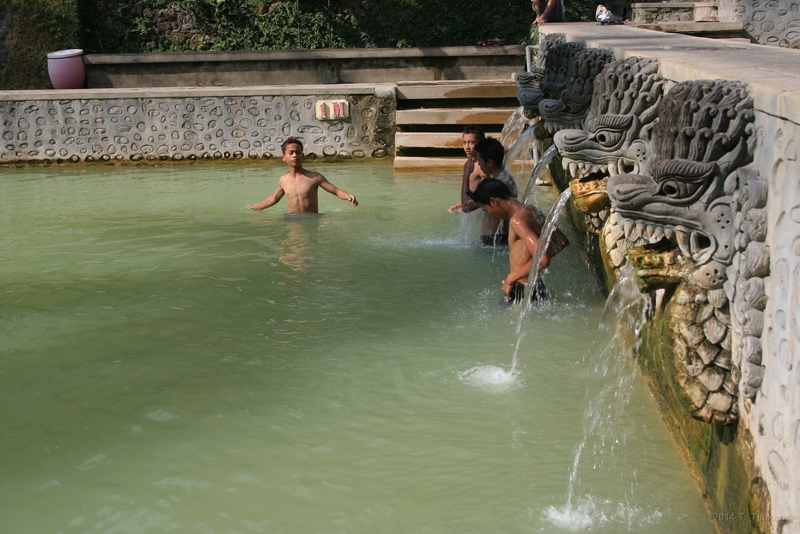 41 Besides the Budhistic temple there are also hot springs in Banjar, they are called Air Panas in Indonesia. 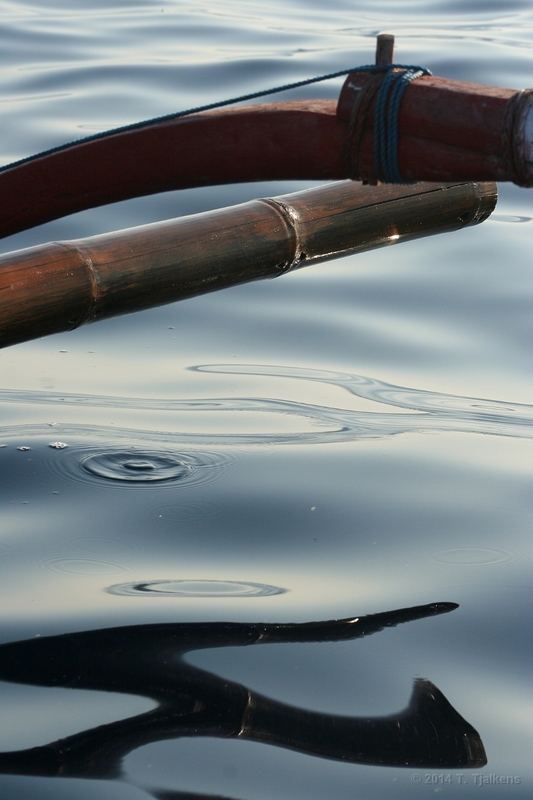 42 The water is heated by vulcanic activity, it is almost 38 degrees Celsius. The local people also like it a lot. 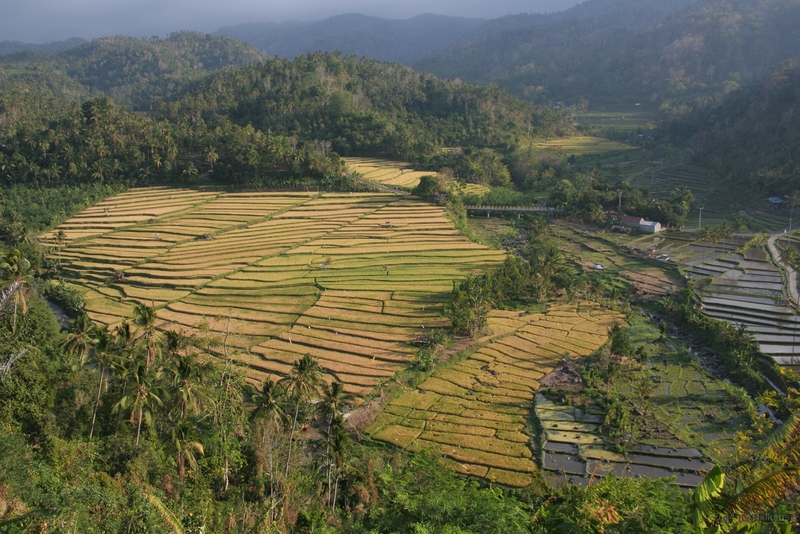 44 Ricefields seen from a mountain. 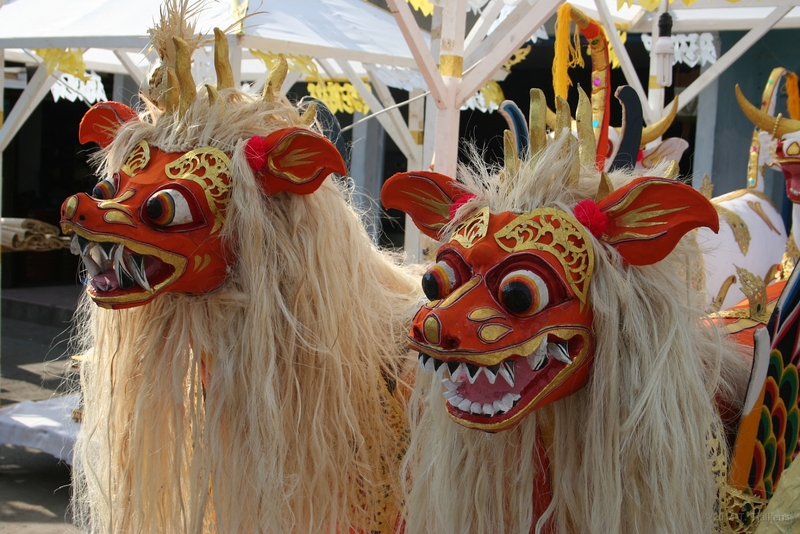 Also near Banjar. 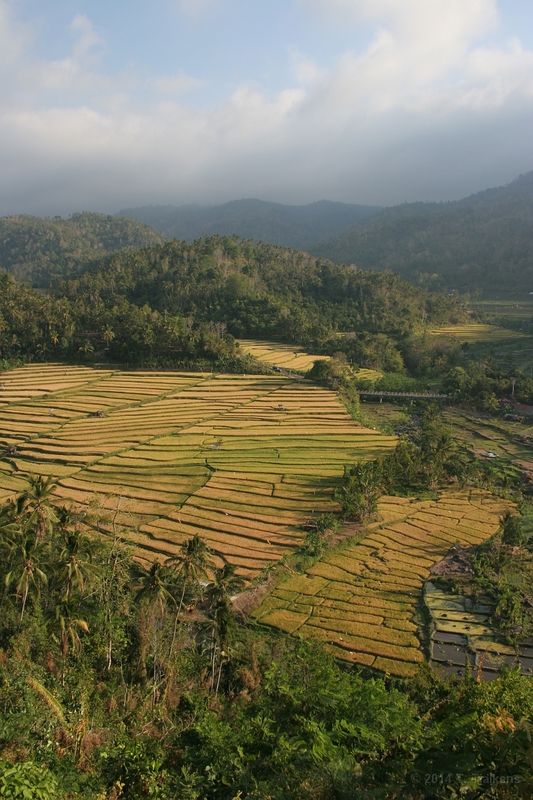 45 Ricefields seen from a mountain. 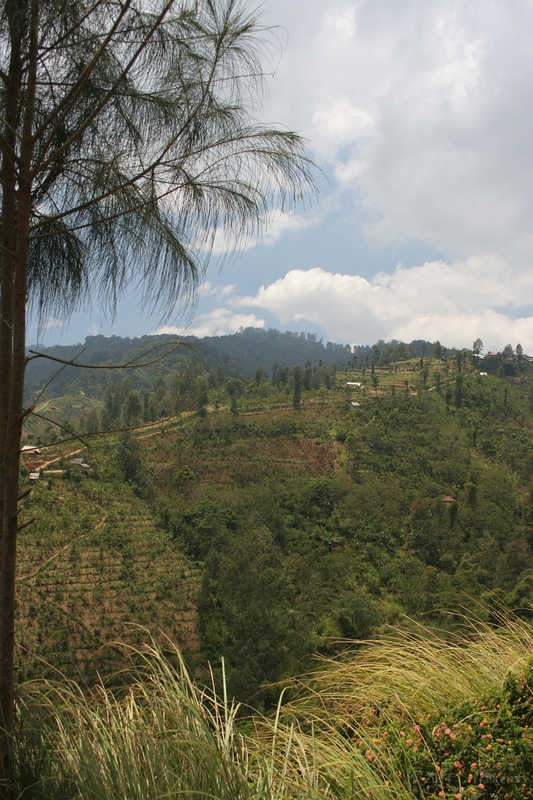 Also near Banjar. 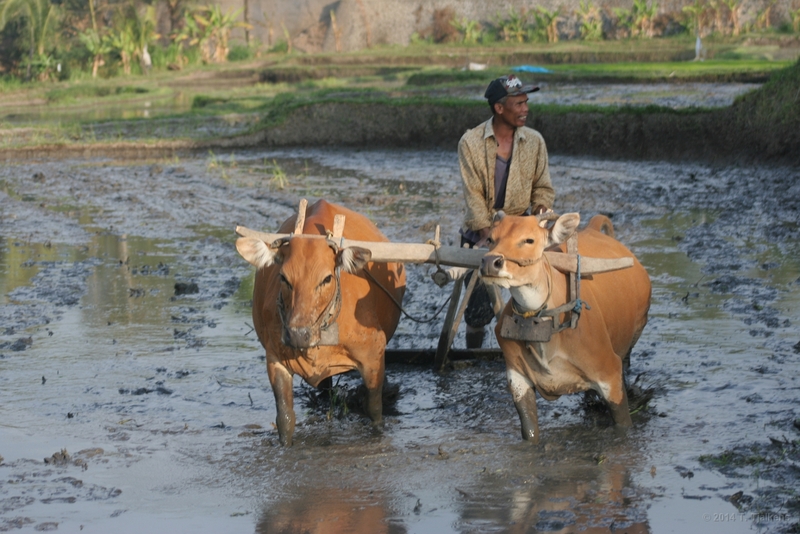 46 A farmer is working on his ricefield with the help of two cows. 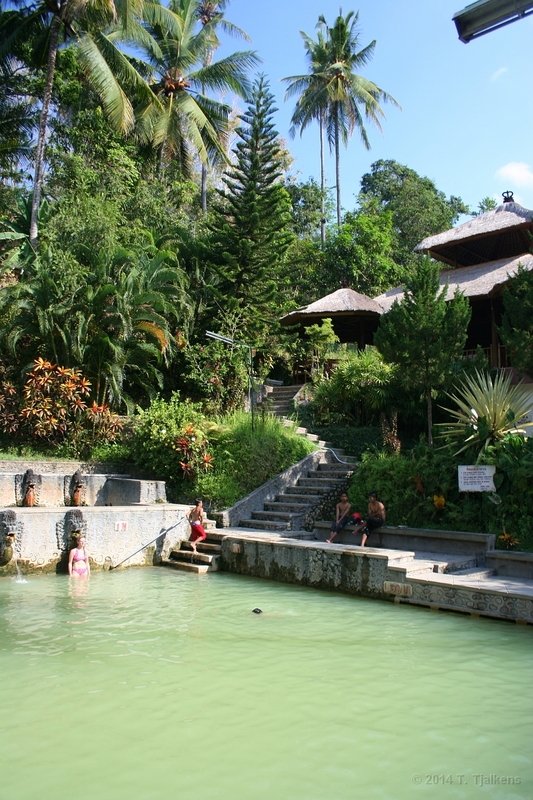 15 Km from Banjar. 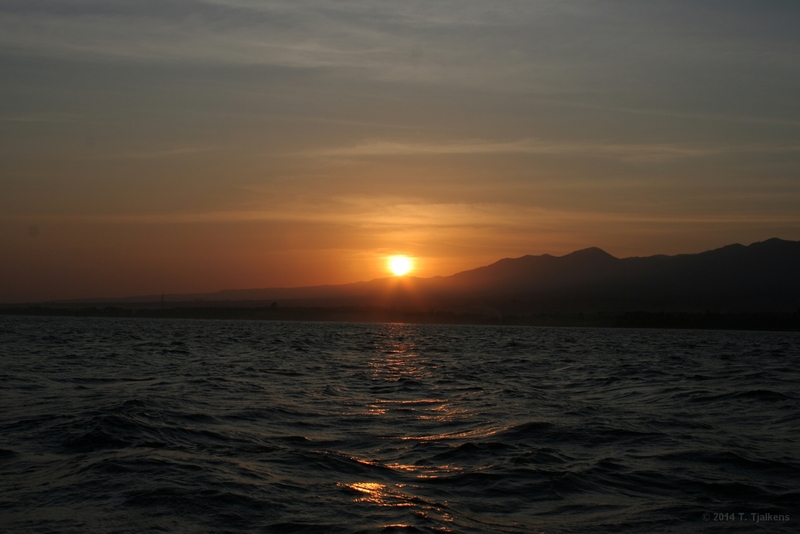 47 If you want to see Dolphins in Lovina you have to get up early so you can see the sunrise. 48 The sun gets higher and soon it will be 30 degrees again. 49 YES! 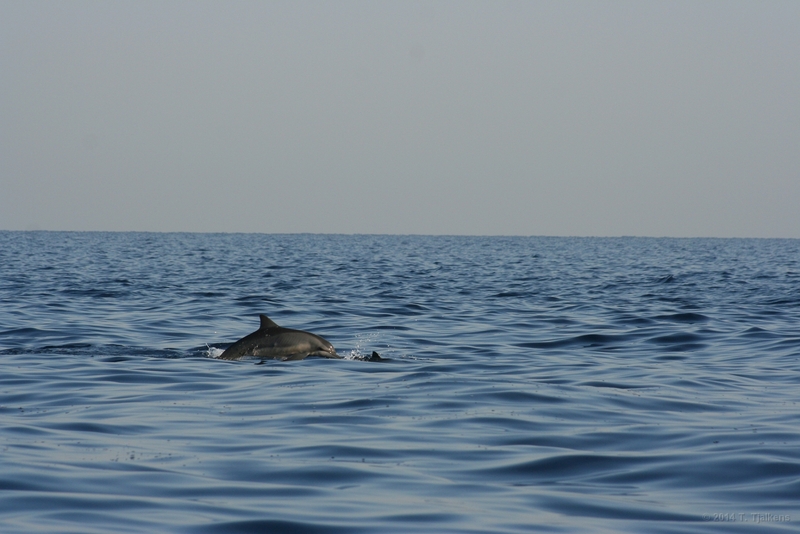 We saw dolphins and a lot of them too! 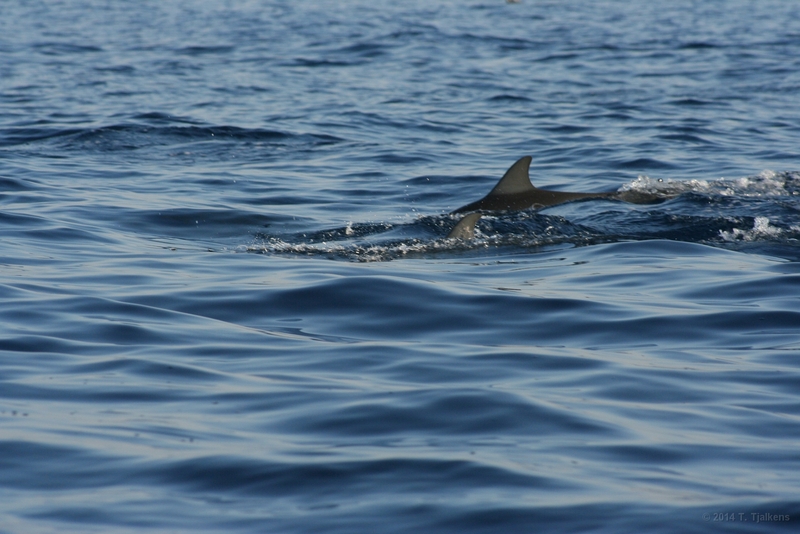 50 Two dolphins hunting for mackerel. 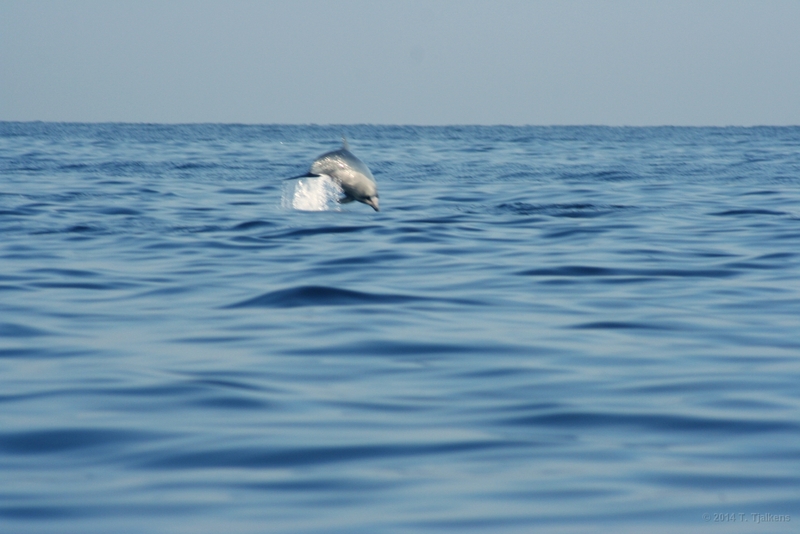 51 It is very difficult to take a photo of a jumping dolphin but at least I got one. 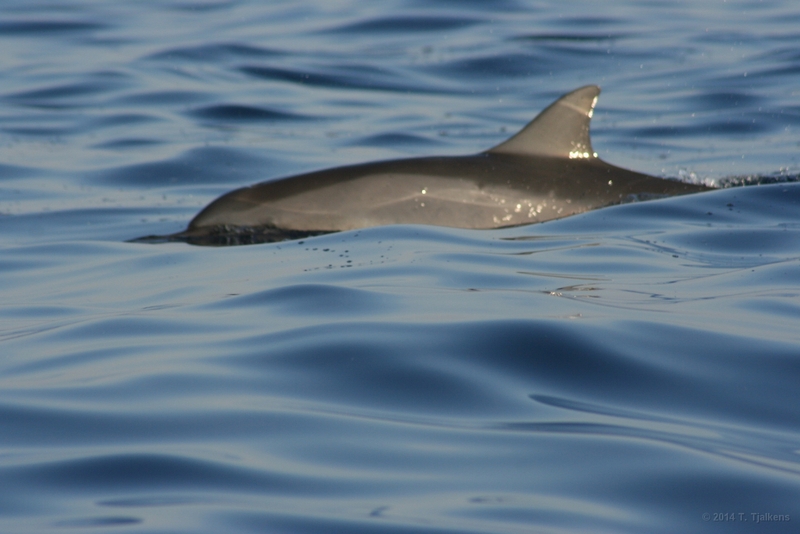 52 This one came very close to our catamaran, you can even see his eye. 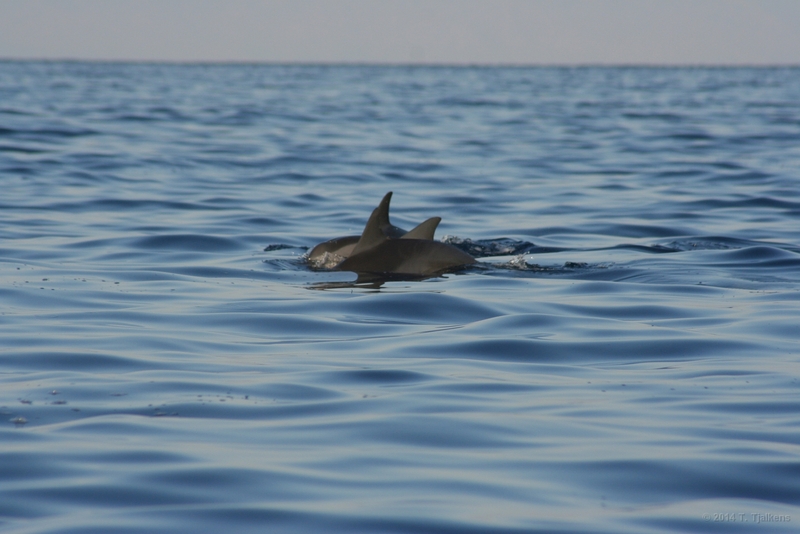 53 Finaly, the dolphins went further from the coast and we had to return, but we have seen a lot of them for almost two hours. 54 Just a detail of our catamaran. 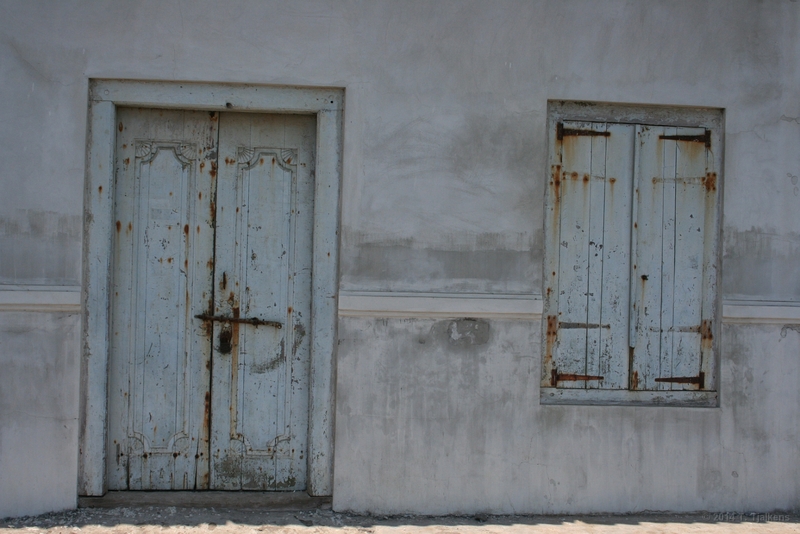 55 Singaraja was the old capital of Bali and there are a lot old houses. This one is near the harbour and could be build by the Dutch. 56 The Passar in Singaraja. Passar means market. 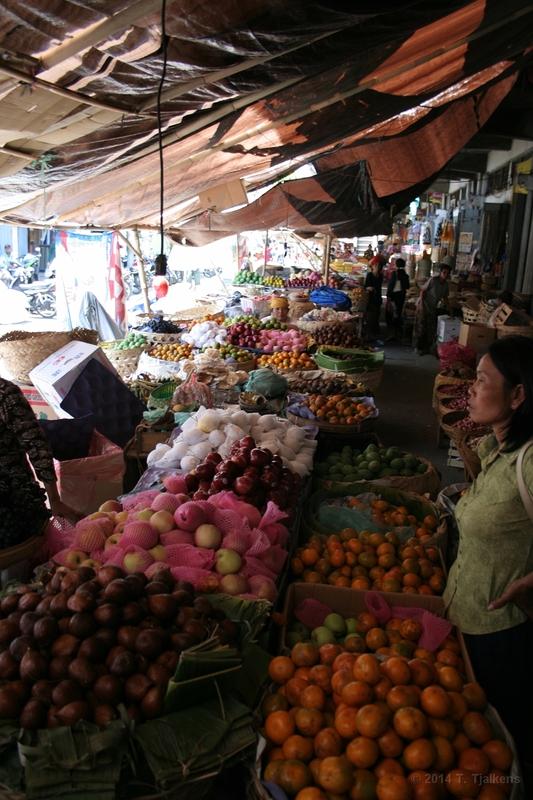 This part of the market is for fruits and vegetables. 57 Normaly you would think that this kind of transportation is for tourists. Well, there are not many (actualy none) tourists in Singaraja. 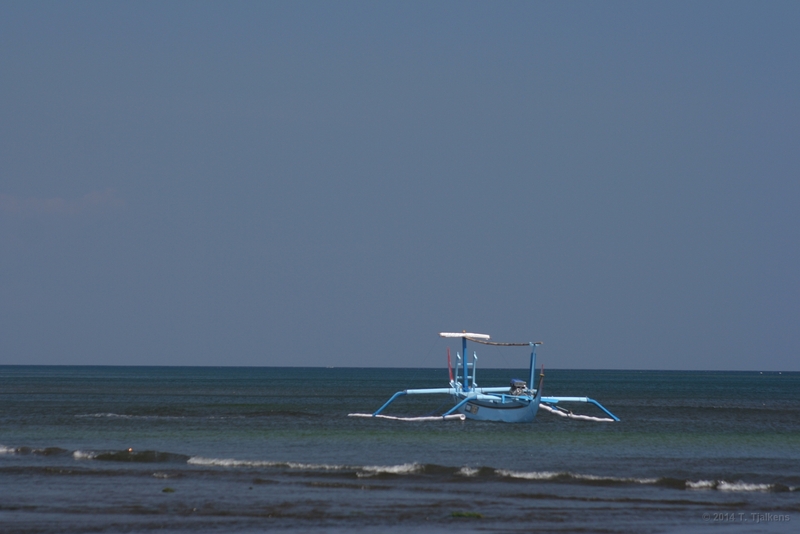 This really is transportation for the locals! 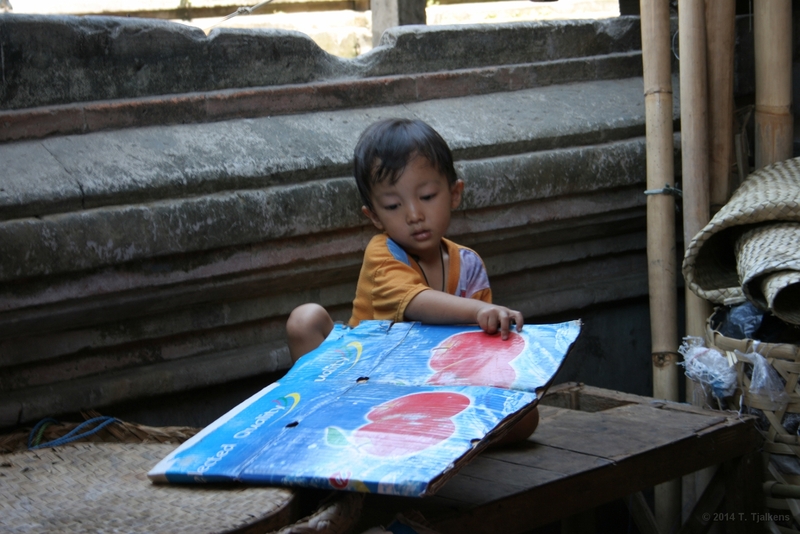 58 Little child playing with a folded carton box at the passar. 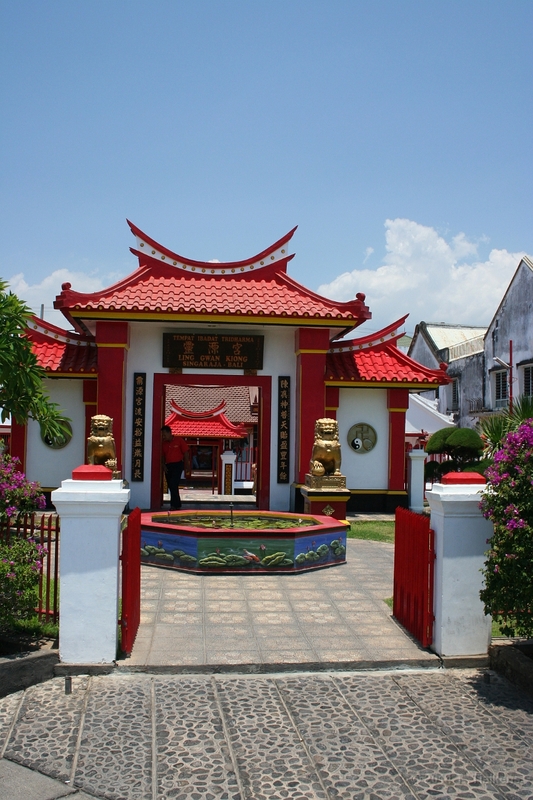 59 The Chinese temple in Singaraja, its very close to the harbour. 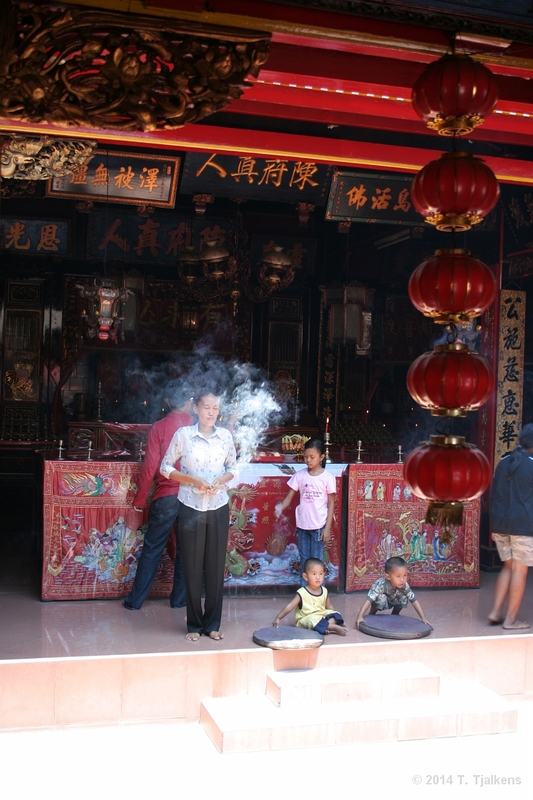 60 Inside the Chinese temple people are praying to their Gods and they use a lot of incense doing so. 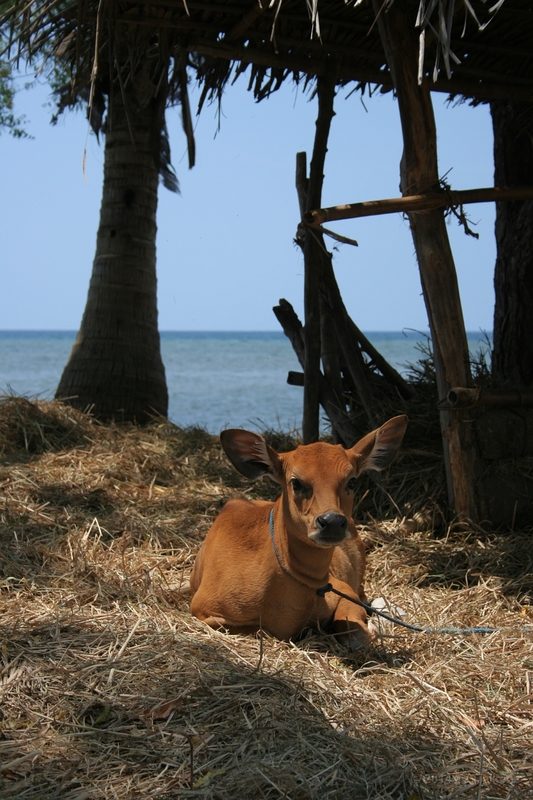 61 This is a Sapi, an very old breed cow. They have a very nice brown color and big ears. 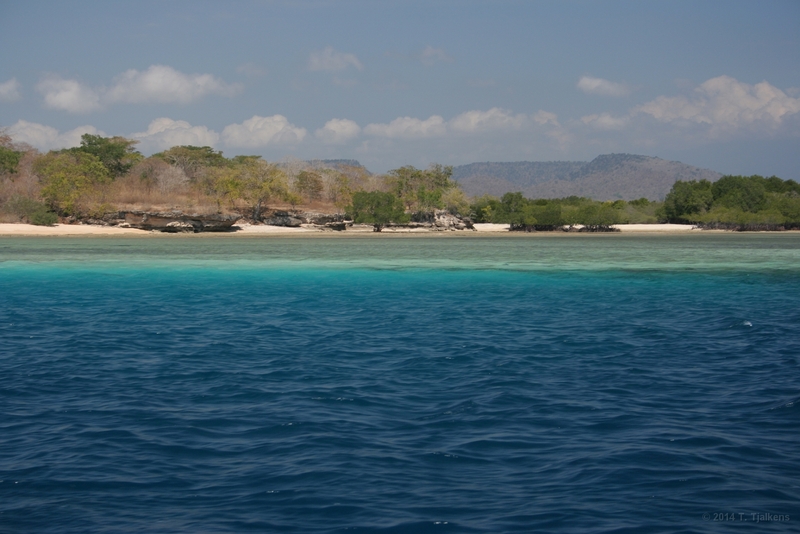 Near Lovina. 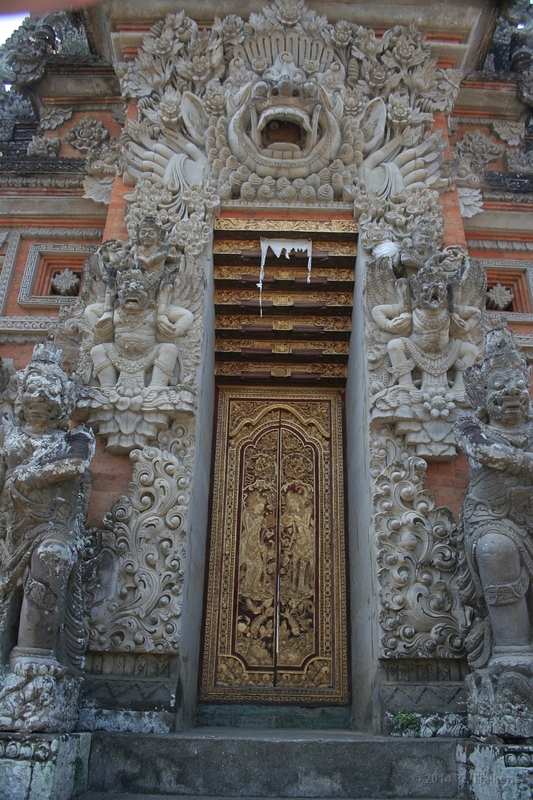 62 The temples at Bali often have very nice carved wooden doors. 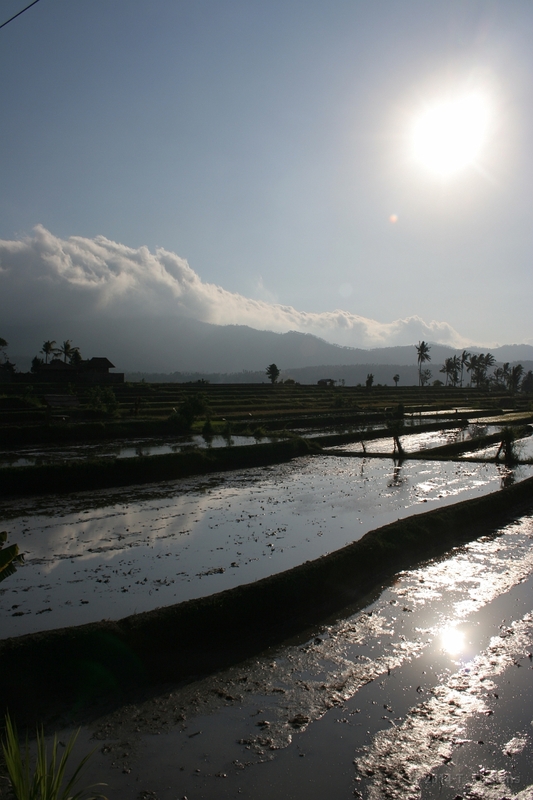 Middle Bali. 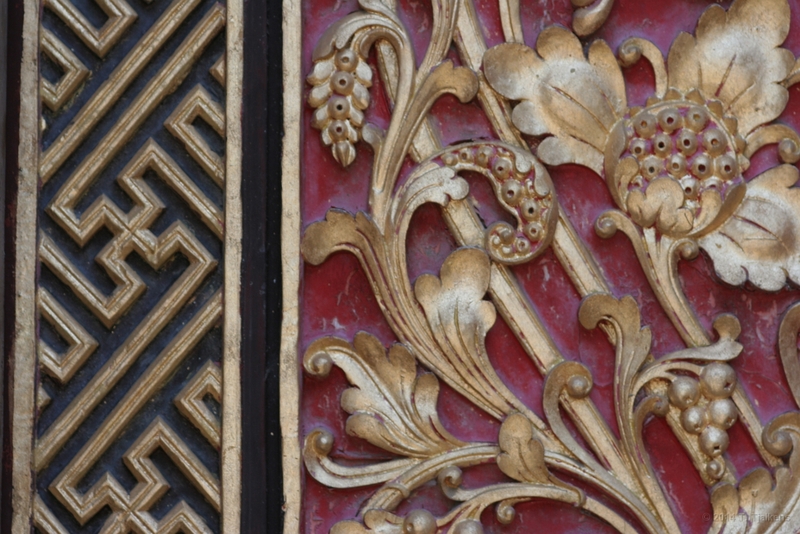 63 A detail from the same door. The work mostly with black, red and gold. 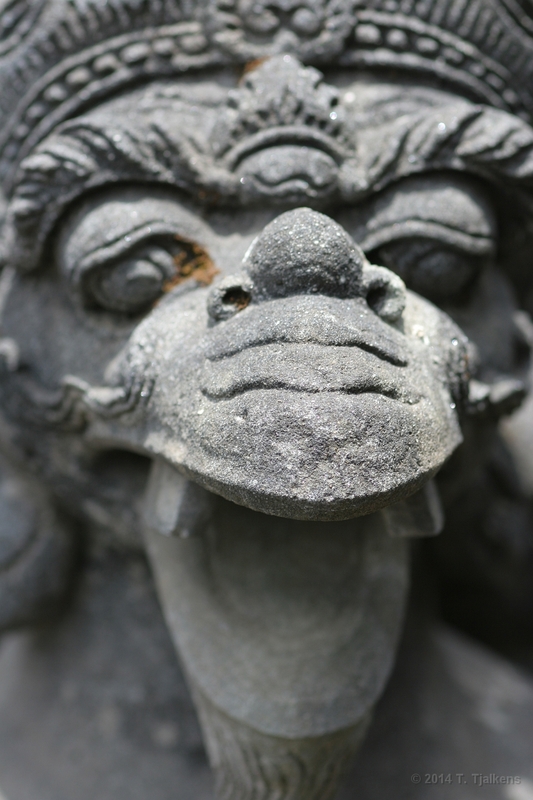 64 This is a statue in a temple we visited on the way to Ubud. The colors in the background give a nice effect. 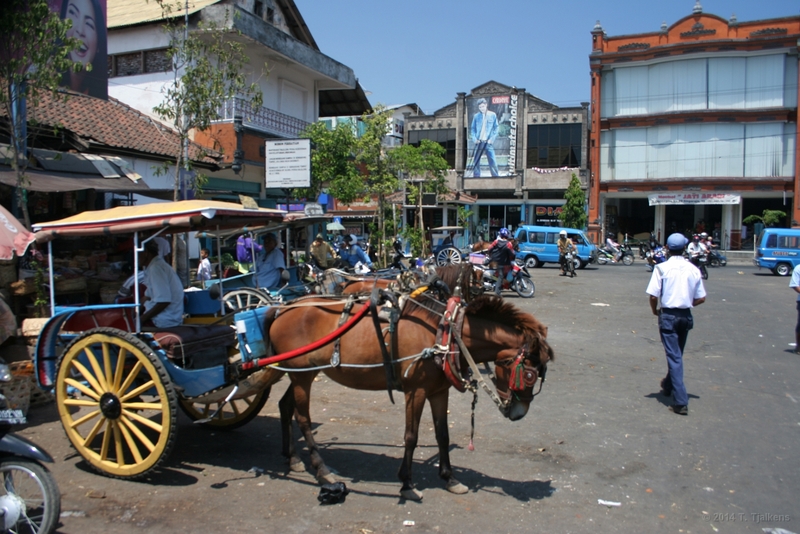 Centre Bali. 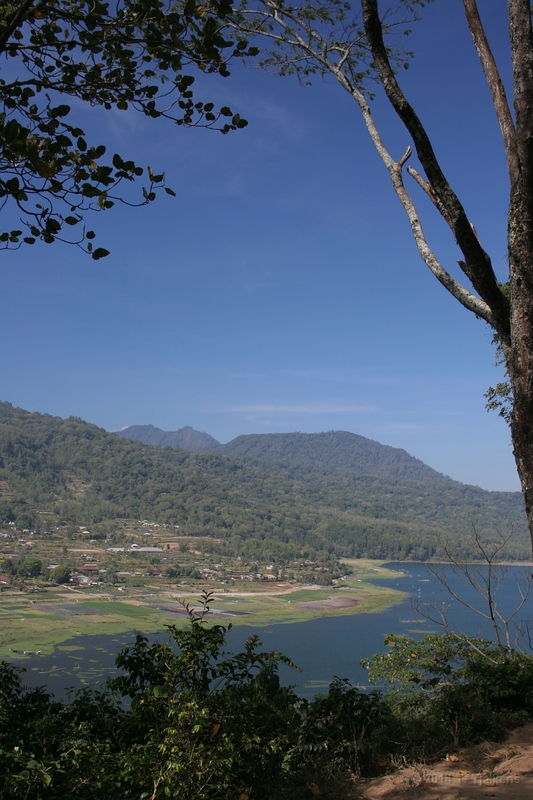 65 On the road from North to South Bali you will pass lake Bratan. 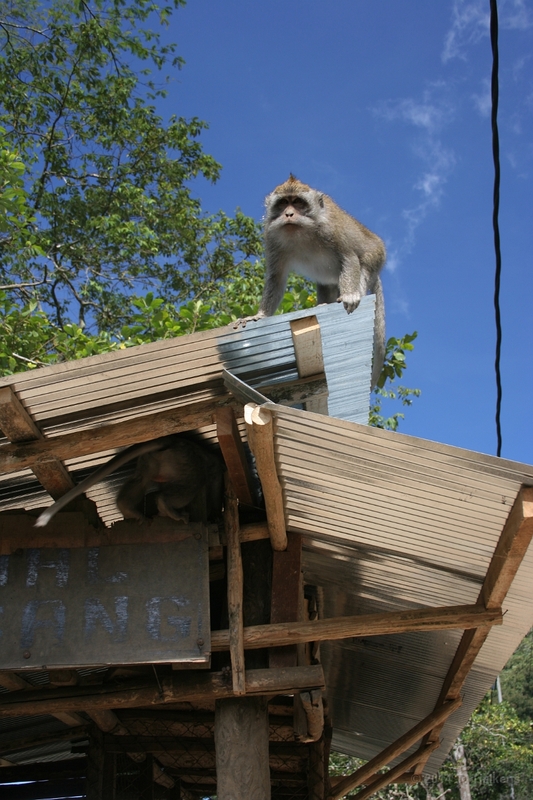 There are a lot of monkeys there. 66 Most monkeys are nice, but this one was very agressive. 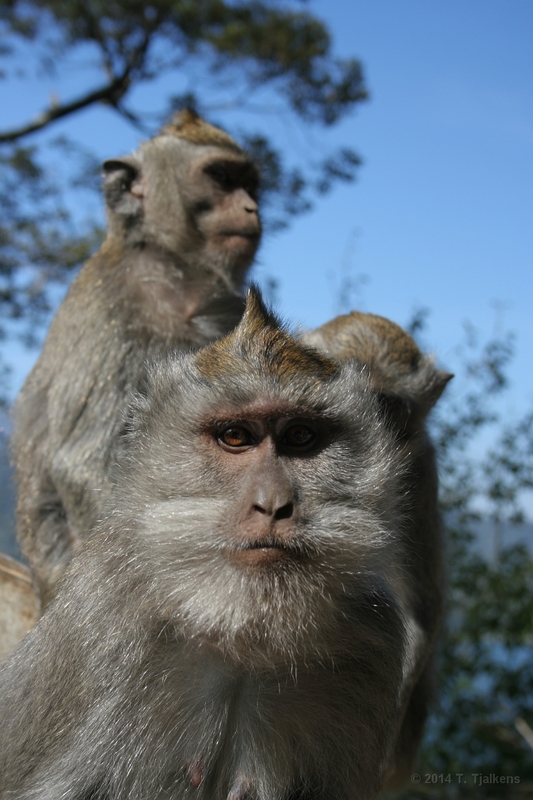 And when a monkey gets angry and shows his 5 cm long fangs you better step back. 67 View from the mountains on the lake Bratan. 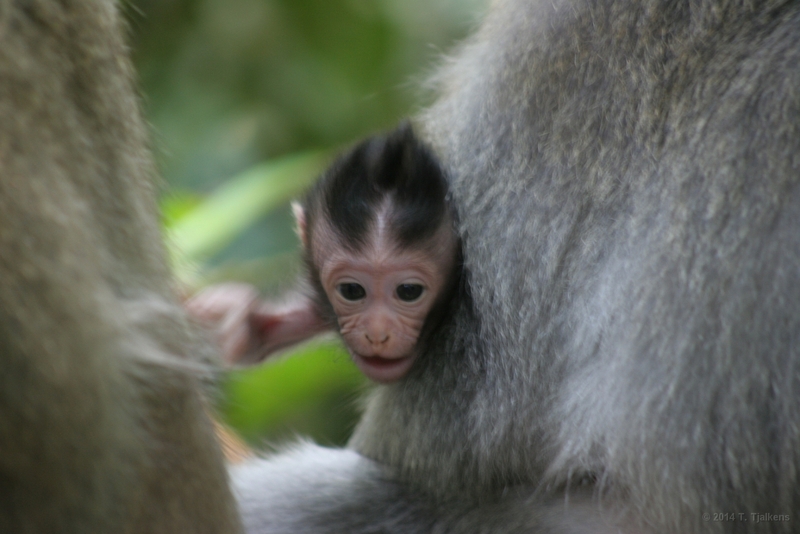 68 A little monkey in the Monkey Sanctuary in Ubud. 69 Part of the Royal Palace in Denpassar. There was a big festival that night so everything was nicely decorated. 70 This is the same door, as you see it is very beautifull carved. 71 Gamelan in the Royal Palace. 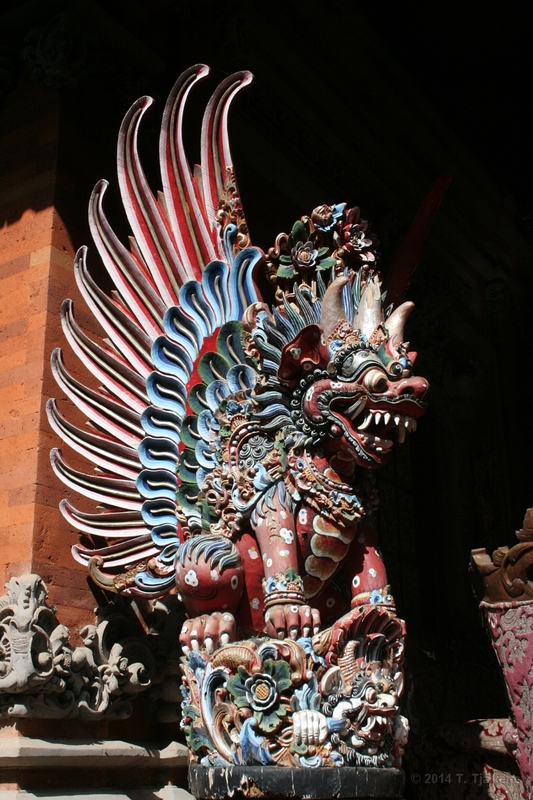 Gamelan is the common word for the instruments, the music and the musician. 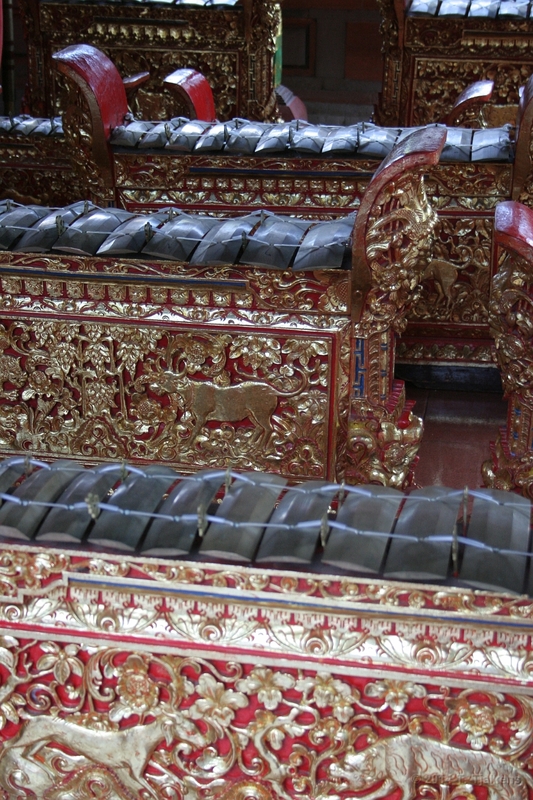 72 Detail of a gamelan. 73 An other detail of the gamelan. 74 Statue of a big colorfull demon in the Royal Palace. 75 This is the main building of the palace. 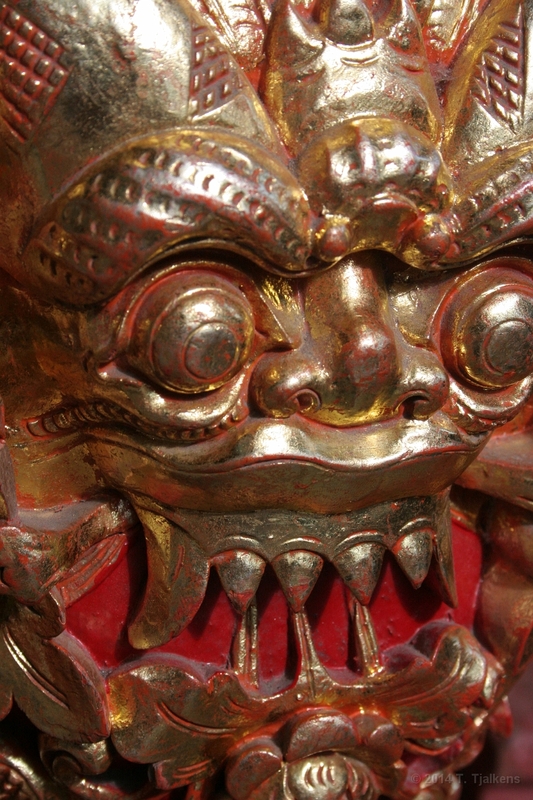 It is decorated with statues, gold and fine materials. 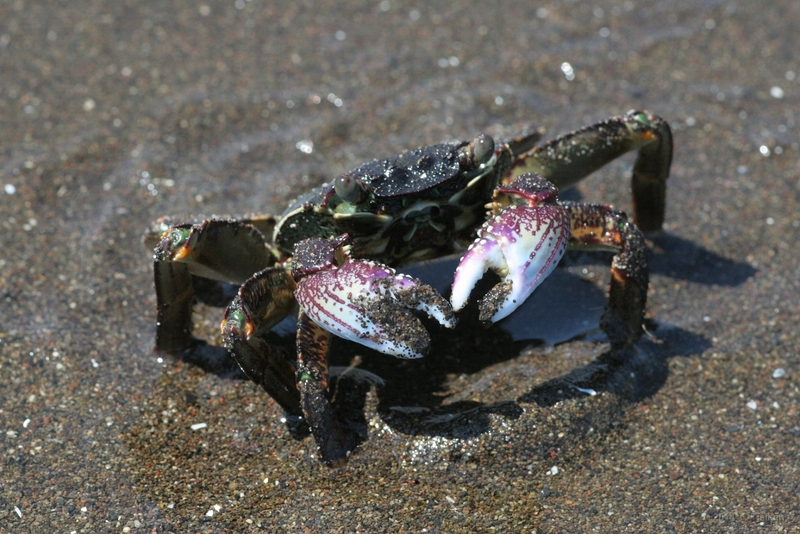 76 Near our villa I saw this crab in the sand. When I took my camera he became a little upset. But that gave me the change for a nice photo. 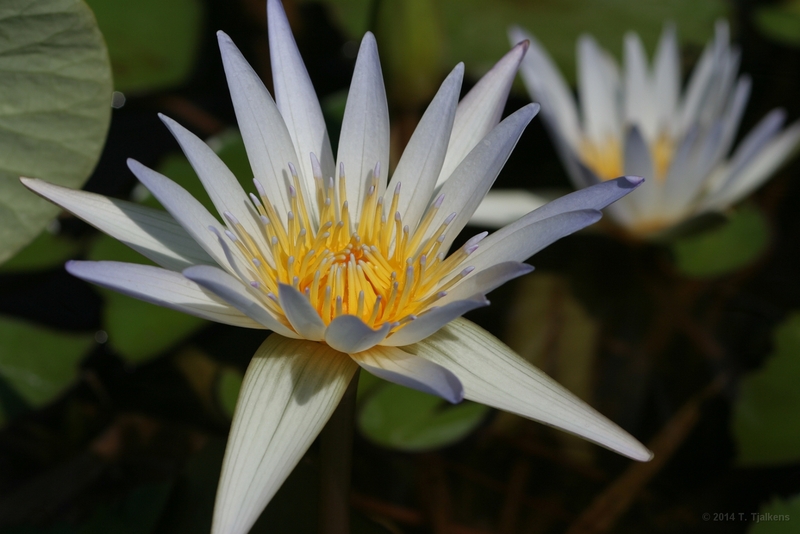 77 The pond of our villa has some nice water lilies. This is a white one. 78 One our way to Menjangang Island, one of the best diving sites of the world with an amazing varity off tropical fish and coral. 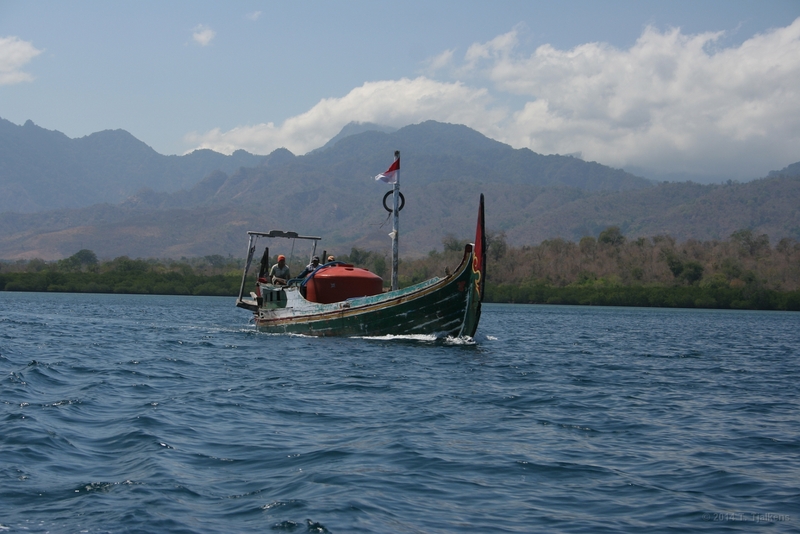 79 A boat on the tropical waters near Menjangang Island. 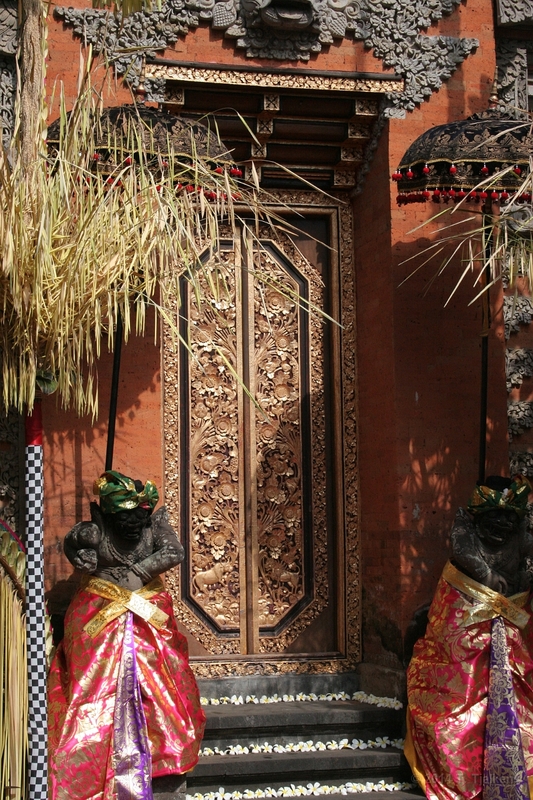 80 This is the Pura Meduwe Karang. 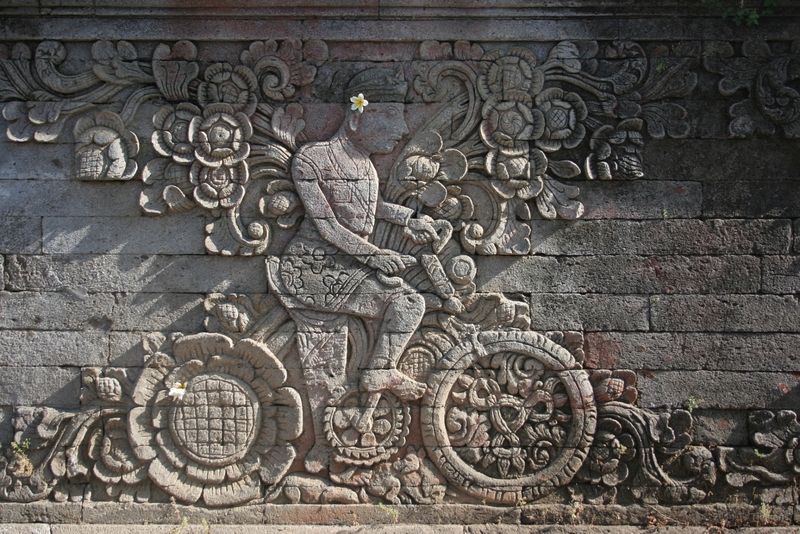 This temple is famous because there is a stone carving of a dutch painter on a bicycle. 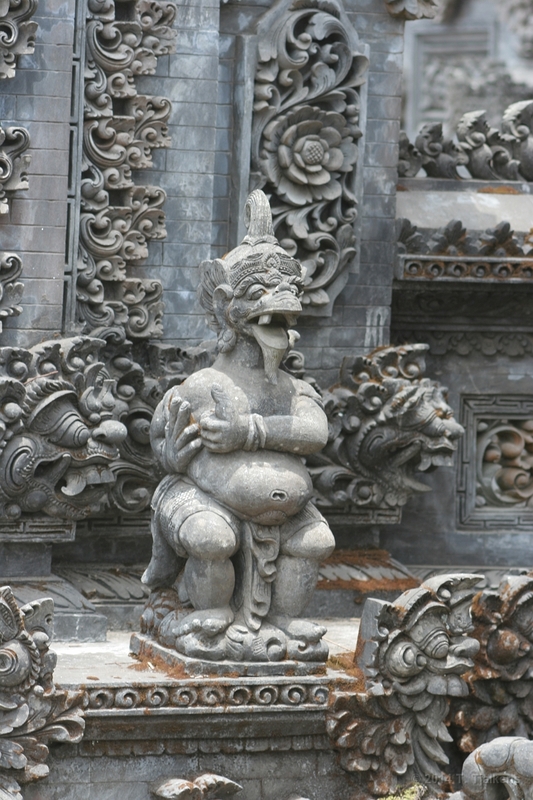 81 A statue in the Pura Meduwe Karang. 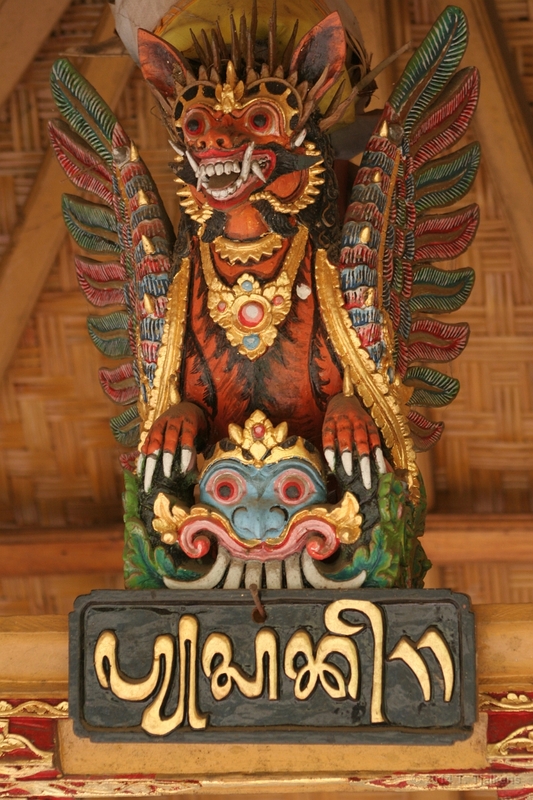 82 A wooden statue of a demon at Pura Meduwe Karang. 83 This is the famous stone carving of the Dutch painter on his bike. The wheel is a large flower and the chain is made out of two animals. 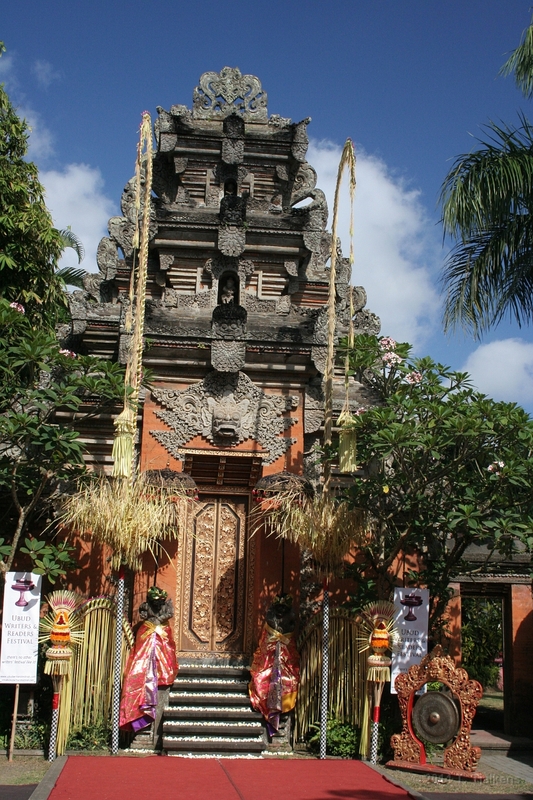 84 Pura Beij is a temple between Pura Meduwe Karang and Singaraja. 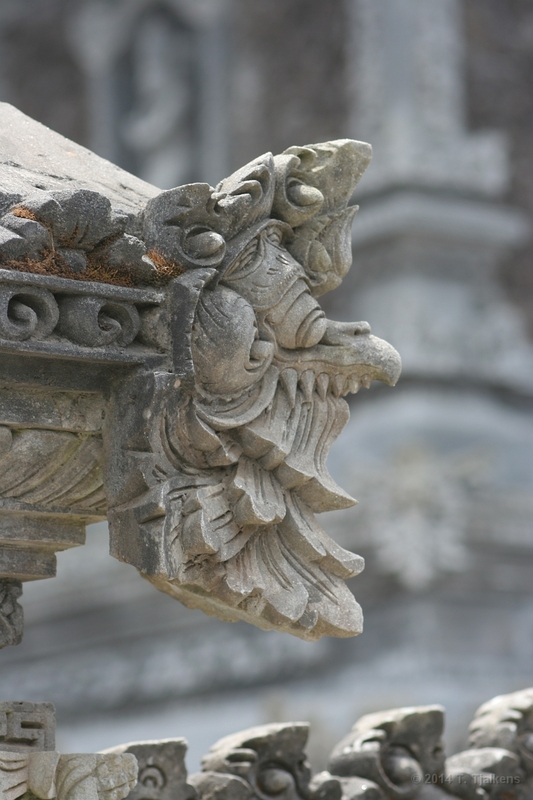 It is word visiting because of the very detailed sculptures. 85 A nice view at the innner courtyard of the Pura Beij. 86 Near Lovina are a lot of vineyards. From the villa you can go for a long walk trough them. 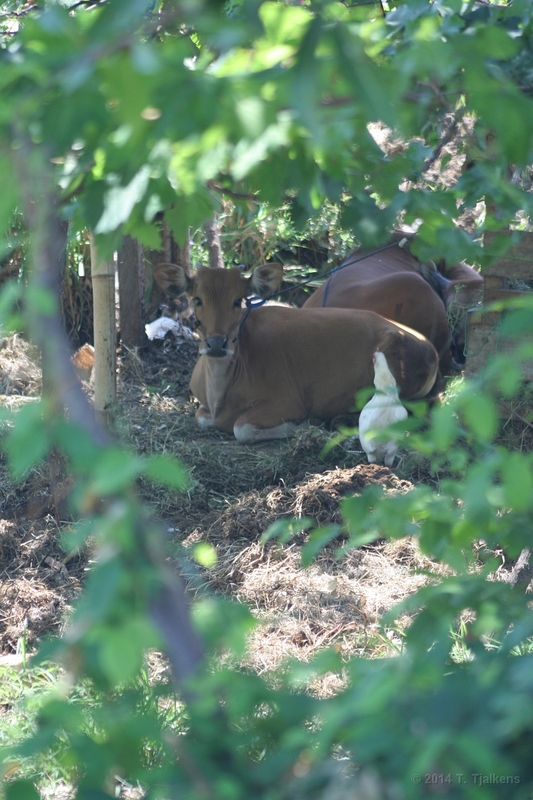 This are some Sapi resting in the shadows. 87 On our way back to the villa we had to stop because a lot of people where going to a big ceremony in a village nearby. 88 The moon is full, so it is time for a ceremony. 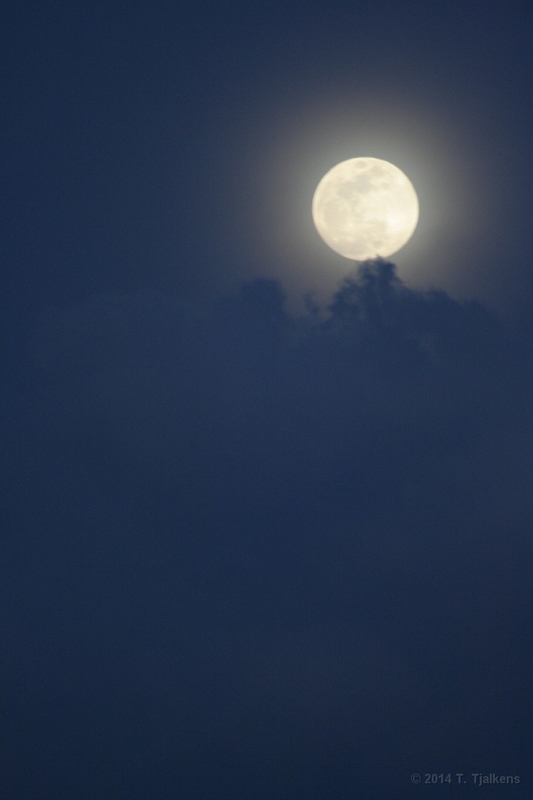 Well, I only took a photo of the moon. 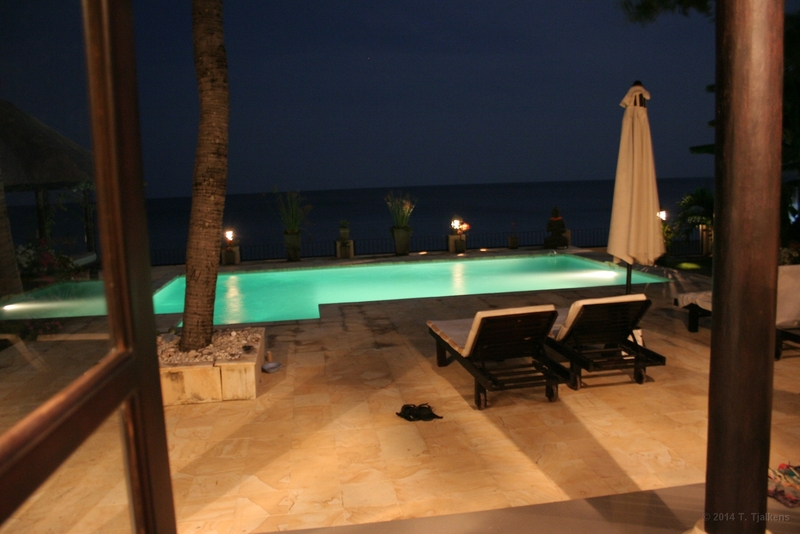 89 The villa is a great place, especialy at night when the lights in the pool are on. 90 This is the statue sitting near the front door, photo made at night. 91 The terrace from the villa at night. 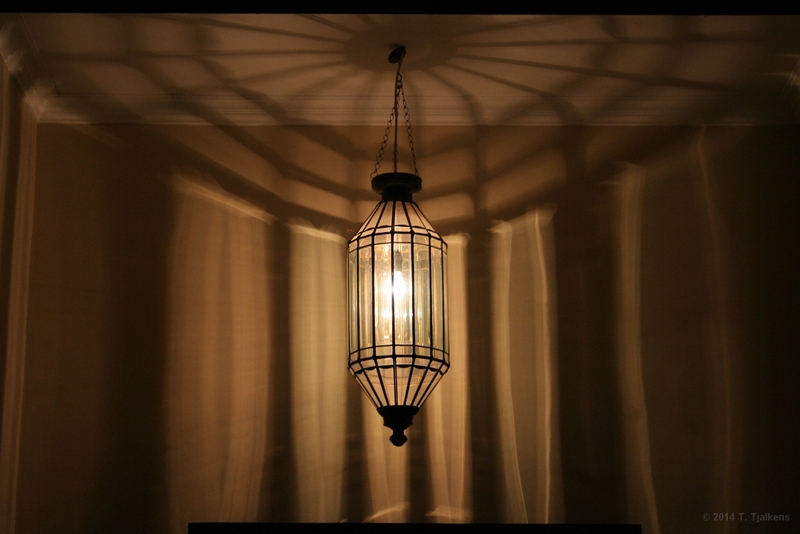 92 A hanging lamp in front of the villa. 93 On the way back we had 8 hours to spend in Singapore so we went with the Singpore citytour to see something from the city. 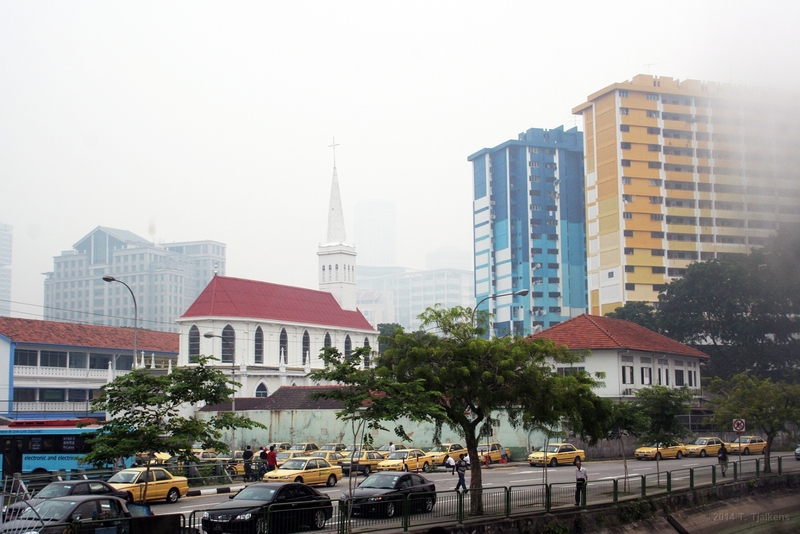 There was a lot of smoke from the bushfires in Sumatara. 94 This is the Sushibar at Singapore airport. 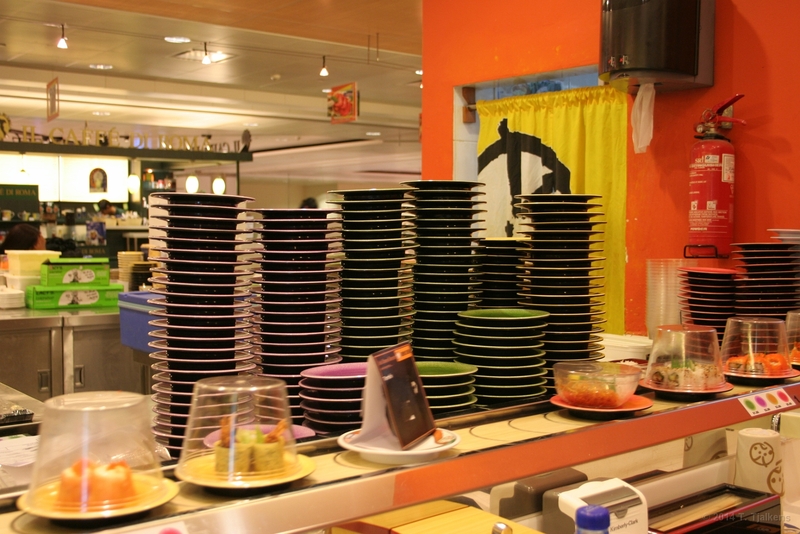 They have Sushi going round at a belt where you can choose from.